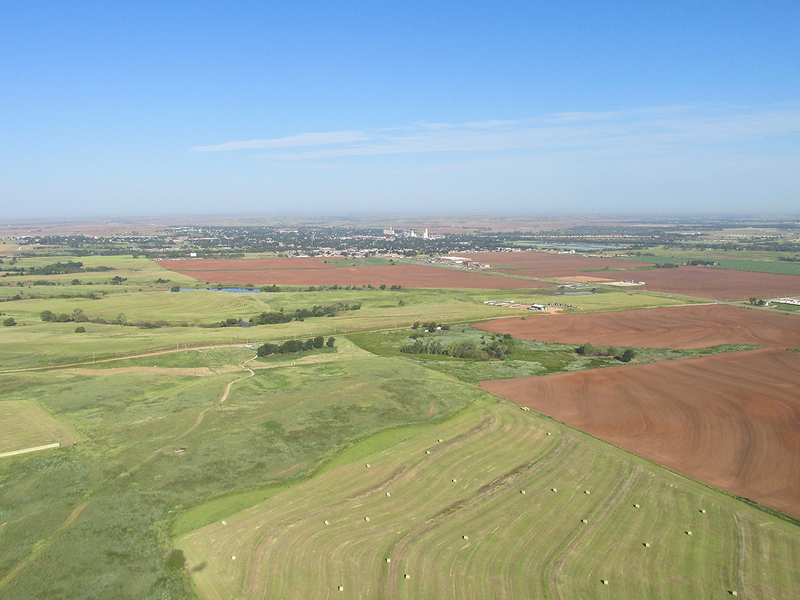 Many of my flights into Oklahoma take me to the famous Cherokee Strip (generally more properly called The Cherokee Outlet although there is a “Strip” also…). This is the place that was opened to settlers on a “first come – first served” basis in 1893 – the famous “Land Rush”. 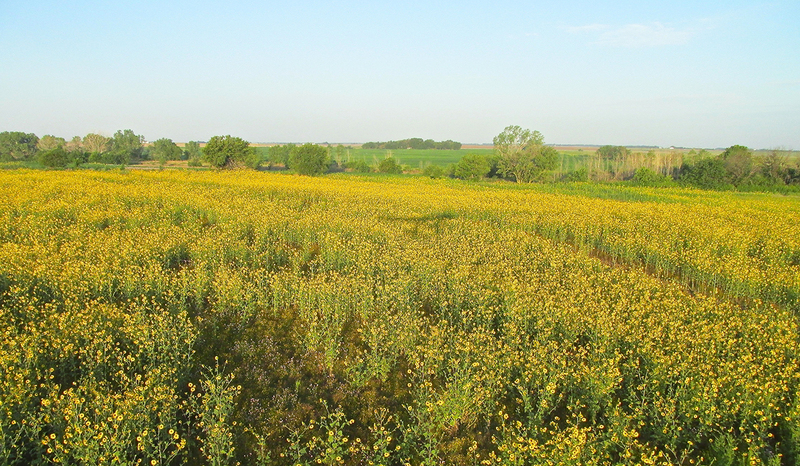 Prior to “the Rush”, the Cherokee Indians owned the land and would lease it out for cattle grazing use. After the Civil War, though, the U.S. Government summarily re-negotiated the treaty it had with the Cherokees because the tribe had made the poor political decision to align itself with The Confederacy. This did not sit well with the North after The War and subsequently the Cherokees were forced to sell the land to the Government for $8,595,000. I bring this to your attention because popular culture (revisionist history?) would have us think all Indian Land has been stolen. Not necessarily so. 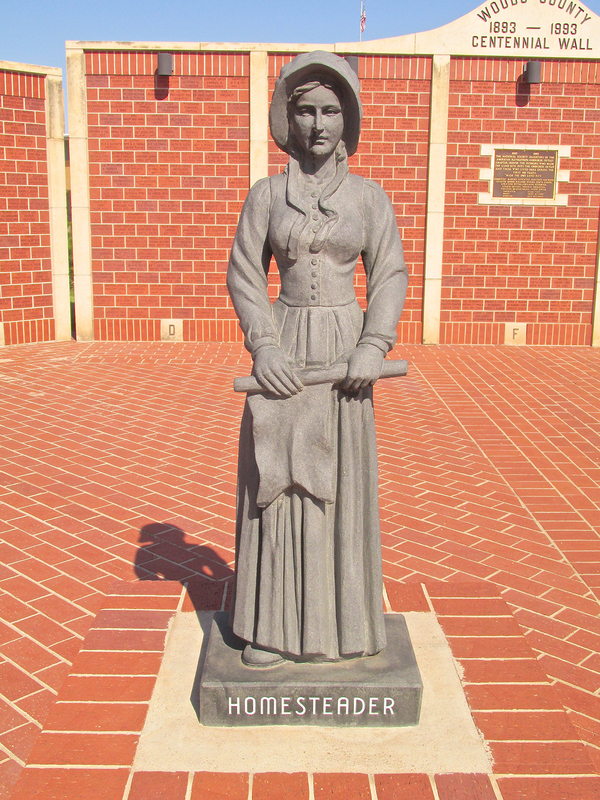 UPDATE: While researching some history on a later story about Foraker, Oklahoma I found details lacking in the above commentary. I don’t claim to be an expert on the history of this area but I want to be as accurate as possible. After spending two hours in research the plot thickened. Apparently in 1866 the Osage Indians bought much of the land from the Cherokees. This was while Oklahoma was a Territory and not a State. 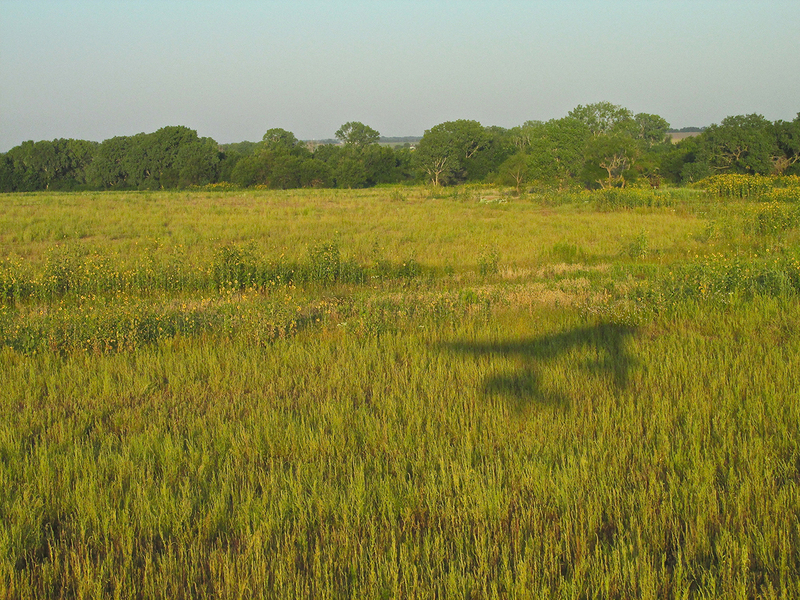 During the Cattle drive era, Texan herds would travel through this land on the way to the Kansas Railheads. 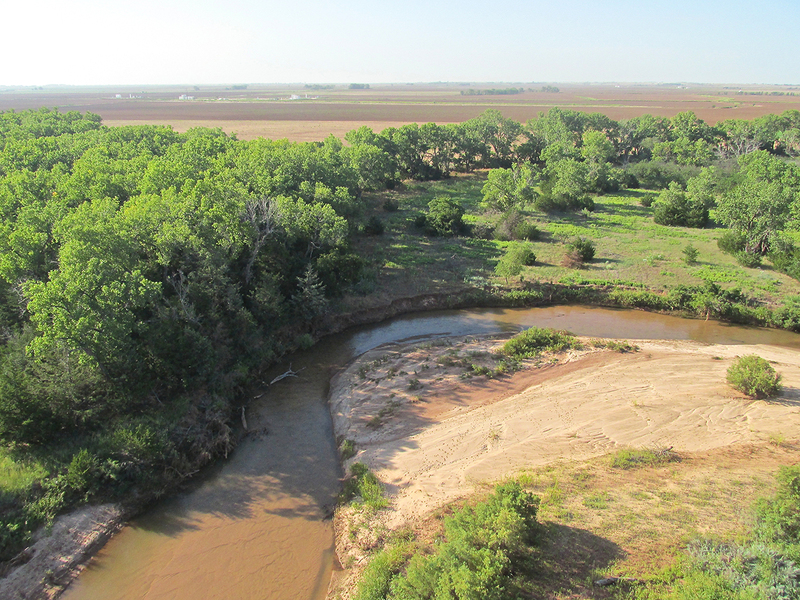 Negotiations were made with the Cherokee and other land owners for grazing payment. After an initial 5 year agreement, the Consortium doubled the price which The Congress of the United States nullified. Congress then authorized the land to be sold for $1.25 an acre to which the Cherokee and other tribes of the area strenuously objected. To force the issue, in 1890, President Benjamin Harrison forbade any grazing in the area, the landowners capitulated and sold out for $1.40 to $2.50 per acre. During that same period of time The Cherokee Commission was ordered to “persuade” the Cherokee to part with the remaining unsold land. The sum of $8,595,736.12 was determined to be the value. Payment did not occur until 1964, at which time the value was determined to be $14.7 million plus $2 million in interest and was paid to heirs. There is more but that is a more detailed explanation than I had given earlier. My flight to Alva would be directly Southwest of Selby Aerodrome. 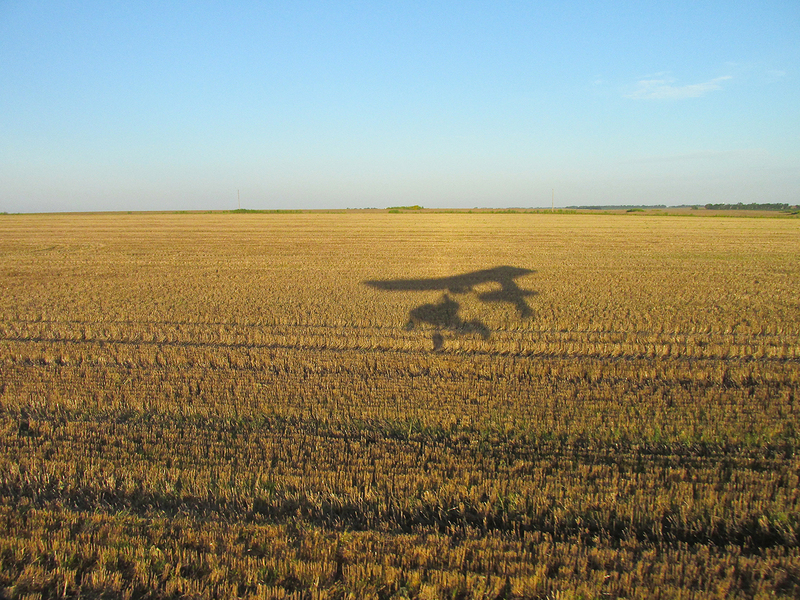 This is one of my favorite directions to fly across the prairie because it is so open, flat and unpopulated. 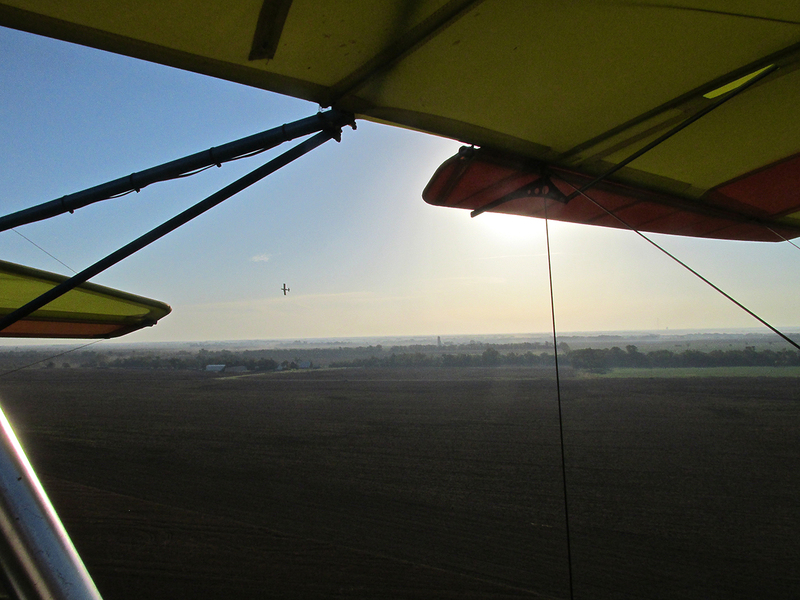 The wind was forecast to be from the Southwest that day at 8 mph so I would easily be able to fly under it that morning. With the “wide open-ness” of the territory I would be crossing, I could fly low enough to take advantage of “Ground Effect” also. This would further reduce my fuel consumption. In addition to all the aforementioned positives for the flight would be the fortuitous positioning of the Sun. Fortuitous if, like me, you like to see silhouettes of my Quicksilver Ultralight cast over interesting prairie backdrops. If that scenario does not peak your interest, you might want to skip over the next 15 or so photos. This one is both a “GlennView“ and a silhouette at the same time! 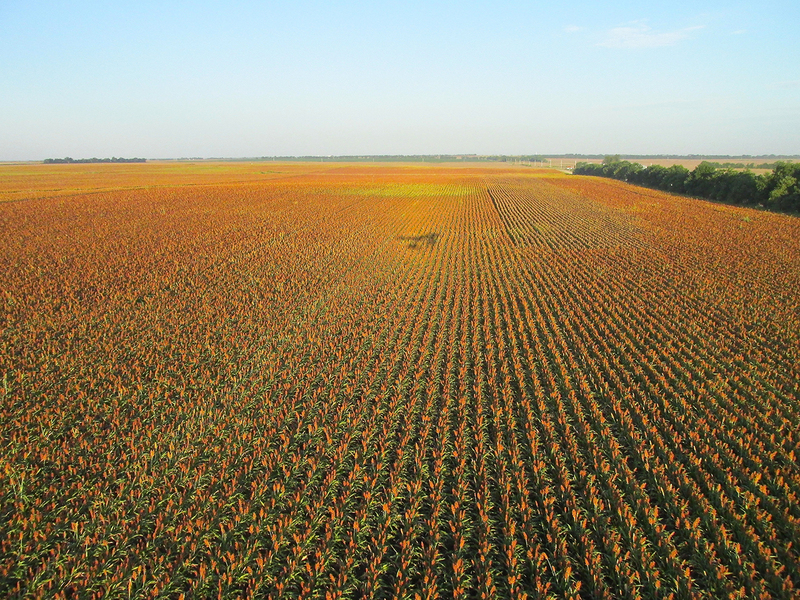 Few crops are more picturesque than Milo approaching harvest time! 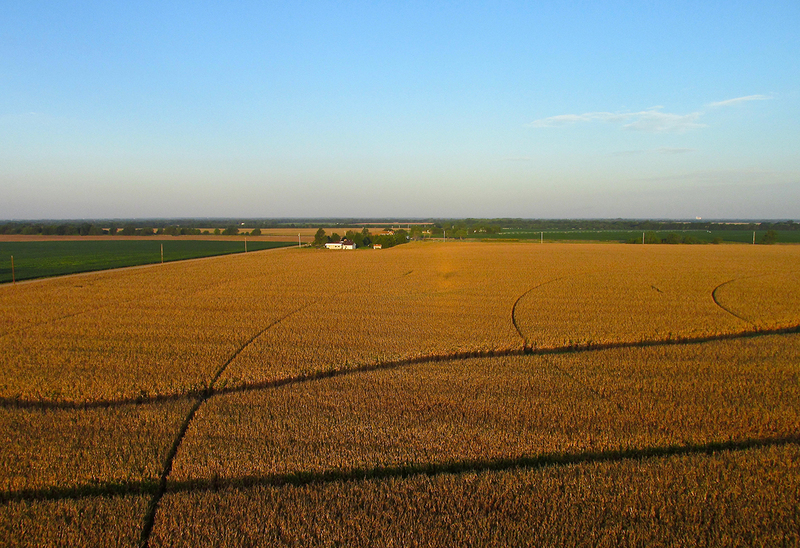 A recently harvested wheat field. A big thing for me when photographing these adventures is to catch the moment. To do this I must have my camera READY. To facilitate this I have the Canon attached to a lanyard hung around my neck. Generally, I can grab it and hit the “start” button and be ready to fire in seconds. My Canon Powershot SX160 has served me very well. There is one issue I have with this Canon, though, and it has to do with the Low Battery Warning Indicator. After much experience I found that it indicates the batteries are dead way too early. I have found that it will function way long after it tells you to change the batteries. The problem is guessing how long. Mostly I keep shooting until it summarily shuts down. You lose. Shot lost. Suddenly off to the South I saw an Air Tractor making a high pull up after a spray run. So as to make sure he knew that I saw him and also to not interrupt his work, I climbed and turned parallel to his line of travel. I set up for what would be a perfect shot of him making a pass over the crops with the spray behind. In order to set up this Pièce de Résistance, I took this photo as he banked into The Pass. Here is where you get to fill in the “vision”. I had the perfect angle with the sun beaming down from the left and a marvelous green carpet below the Ag Plane as he released the perfect stream of vapor that wafted down behind his plane. The moment I clicked the shutter, the camera shut down. No Go. No time to load batteries and go back. Shot Lost. Completely Inexcusable. Unprofessional. A Debacle of the First Order. Take my word for it, though. This was the “definitive” spray plane shot for the millennium. 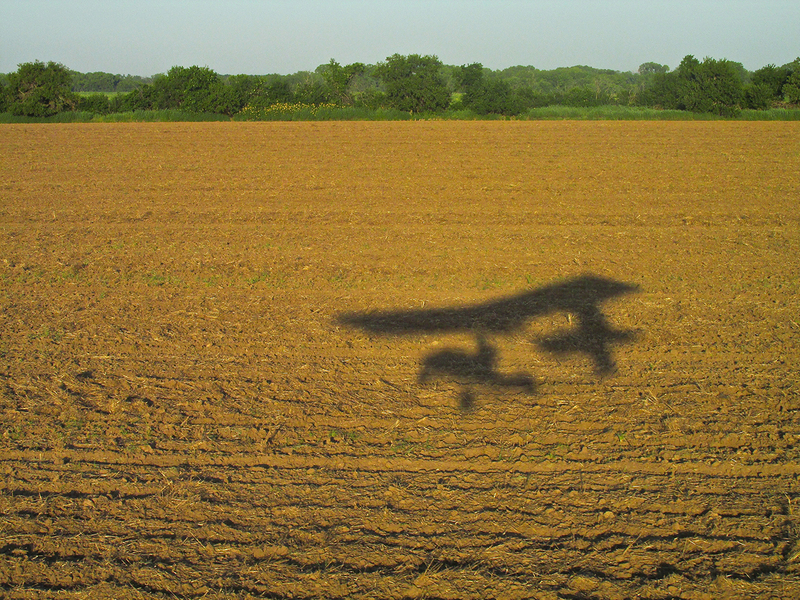 Imagine the purest, most sublime image of a “morning sun, back lit, spray plane” swooping over a magnificent Kansas Corn Field, crystal clear, all colors bright and shining – this was it. I know I can’t be “The Lone Ranger” on this but, I think modern tractors are very attractive to look at. I put them up there with a ‘69 Shelby Mustang, ‘70 Chevelle, ‘68 Roadrunner, a ‘67 Impala SS, a ‘70 Corvette 454, etc. They have a pleasing line to them that I believe is by design. I think this is wise of the manufacturers because it is no more expensive to make something practical look good than it is to make it look bad. It all depends on the designer’s enlightenment to this principle. Functional things can be art objects, too. The boring, tedious “form follows function” utilitarian design dogma has bequeathed our civilization buildings and cars nobody feels proud to work in or own. I think the goal of modern manufacturers should be to make “form enhance function”. 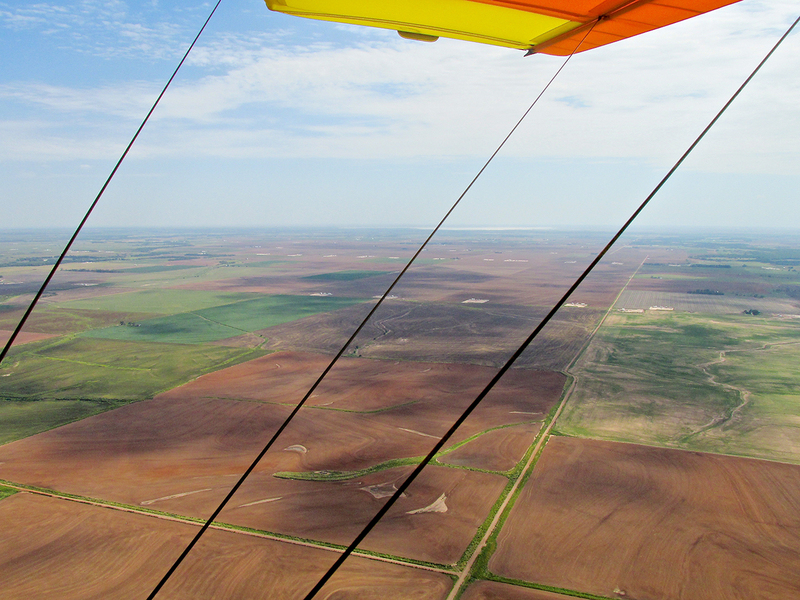 Even though the head wind was minimal, I was flying low because the landscape was wide open on the way to Alva. 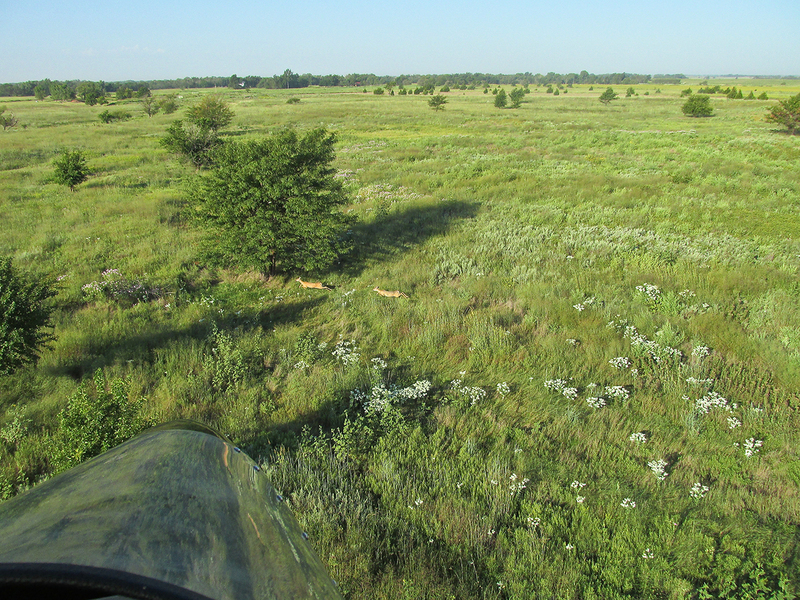 Also, I like the view from 75′ AGL. The town seen below appeared as I popped over a tree row. Frankly, even though I have been there many times I did not recognize it. I have even shot part of a movie on Amateur High Powered Rocketry there. Nonetheless it wasn’t until writing this story that I recognized it from the pictures. 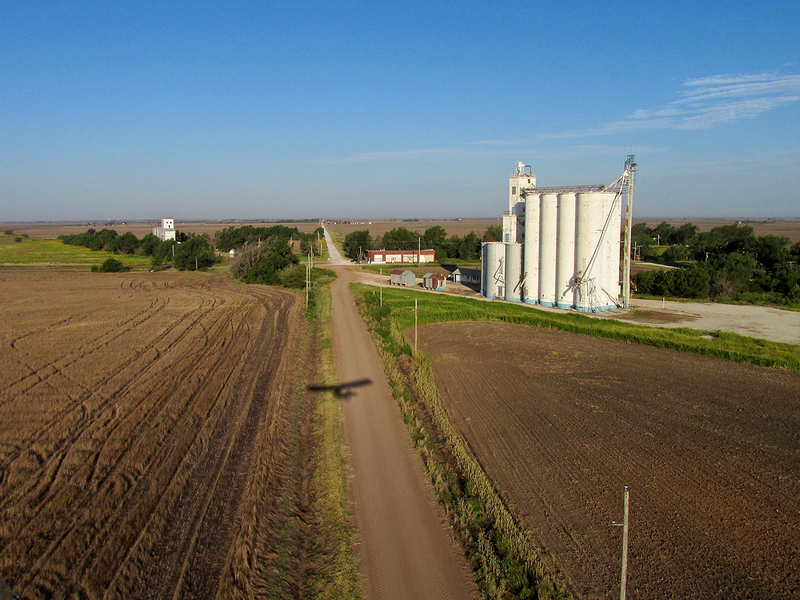 Argonia, Kansas under my right wing from 75′ AGL looking Northwest. 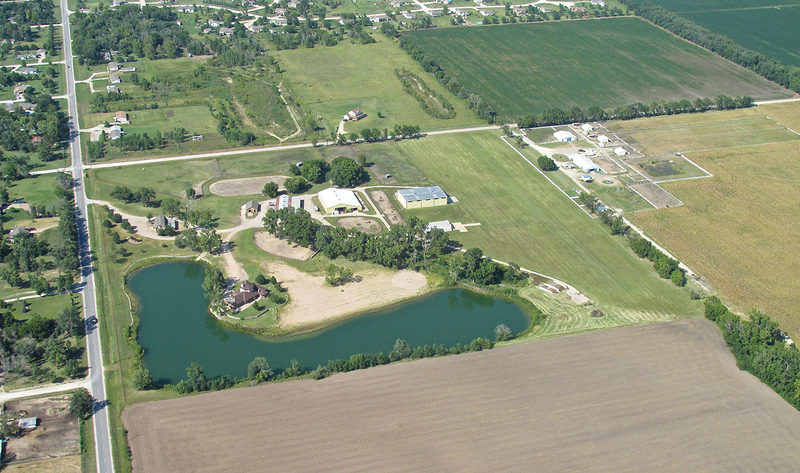 A mile South of town is their treatment facility with an Equestrian Arena next to it. 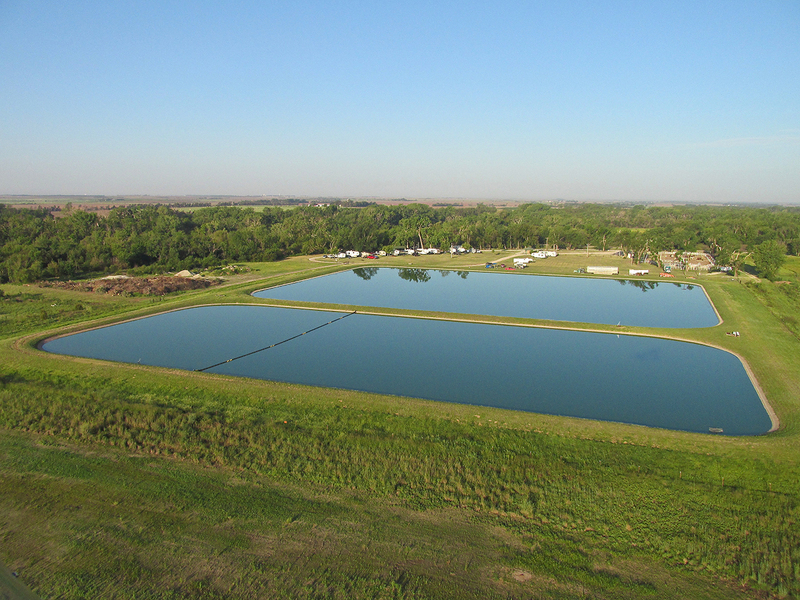 People have arrived for a horse show or contest. 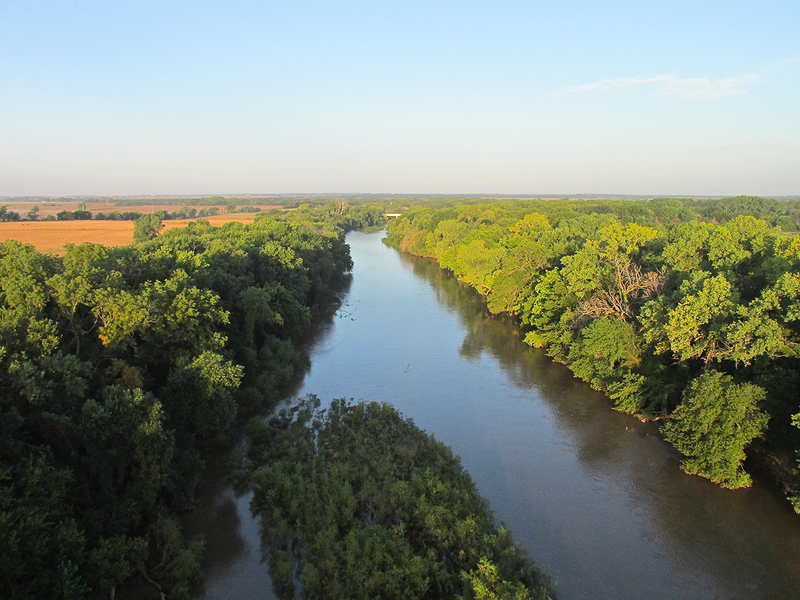 Argonia again looking due North from 75′ AGL just after passing over the Chikaskia River. 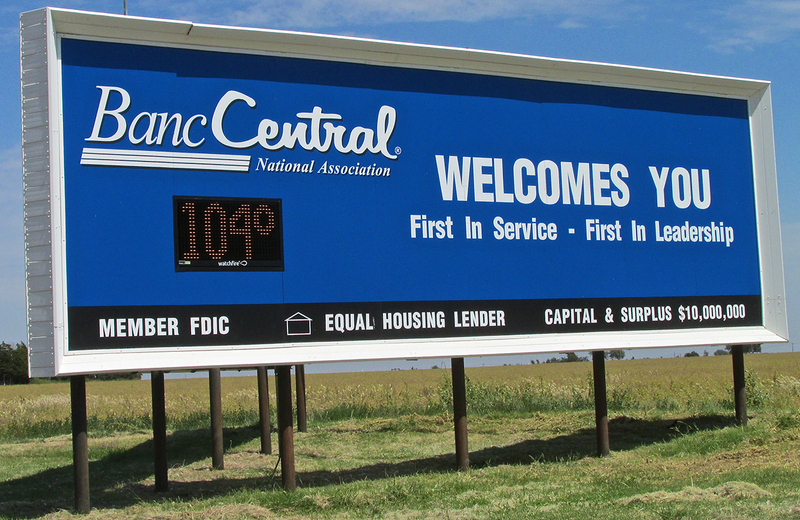 Not long afterward, I came upon Freeport, KS. I was intrigued by it because it seemed about as small as a town can get. 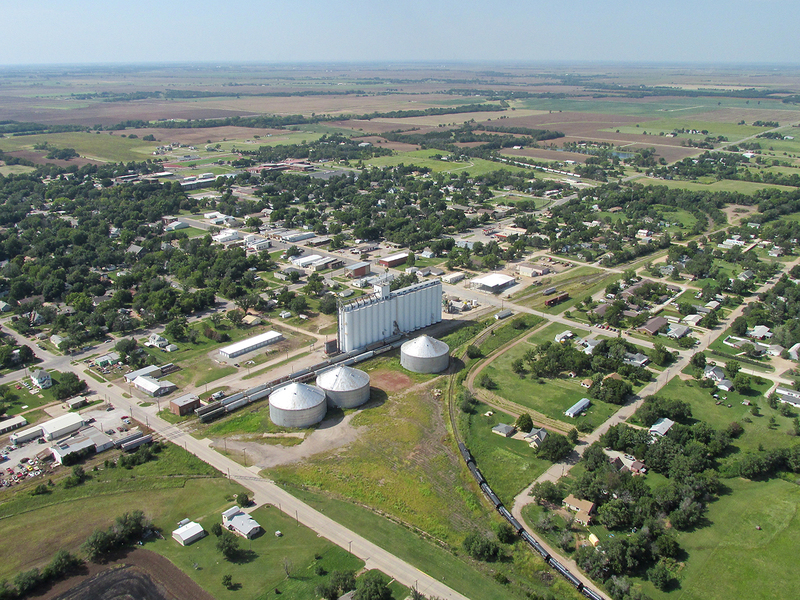 Sure enough, when I researched it for this story, I found it to be THE smallest incorporated town in Kansas. It is inhabited by 5 people. I knew there was something special about it… I will stop there some time. 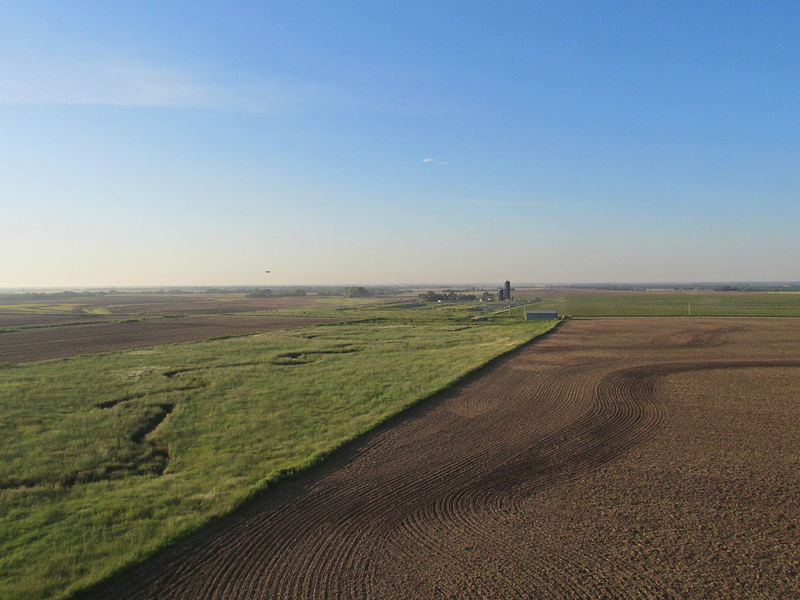 From this distance you can see the “strip mall” no longer in use to the left of the grain elevator. I would have liked to take a closer picture of it but after this shot I climbed and banked left so as not to inadvertently buzz anyone who might be in the area around the intersection. Maybe I am over-doing it but this was one silhouette I could not pass up. Golden Milo Again. 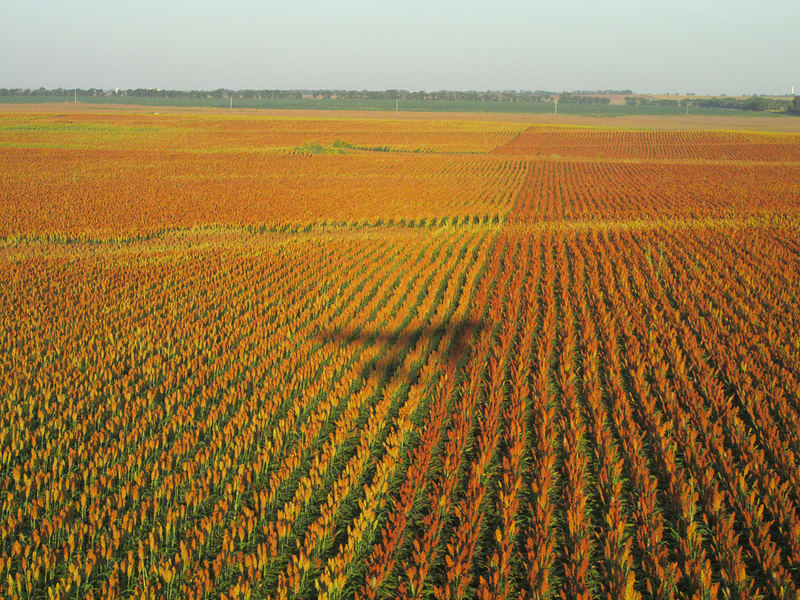 Have you ever seen such a handsome crop? Another silhouette I could not leave behind. There isn’t a weed in this field. The instant I crossed the border into Oklahoma the ground turned red. 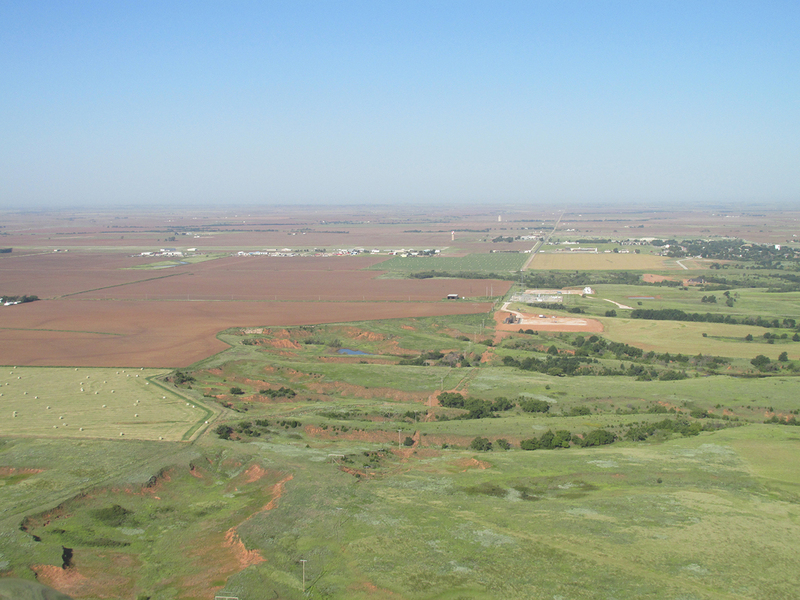 Well, in the general area of the border it did… It is a distinctive trait of the Oklahoma landscape and one the state’s citizens are proud of. I noticed on The Web that Texas talks a lot about their Red Dirt but I have never associated it with The Lone Star State. 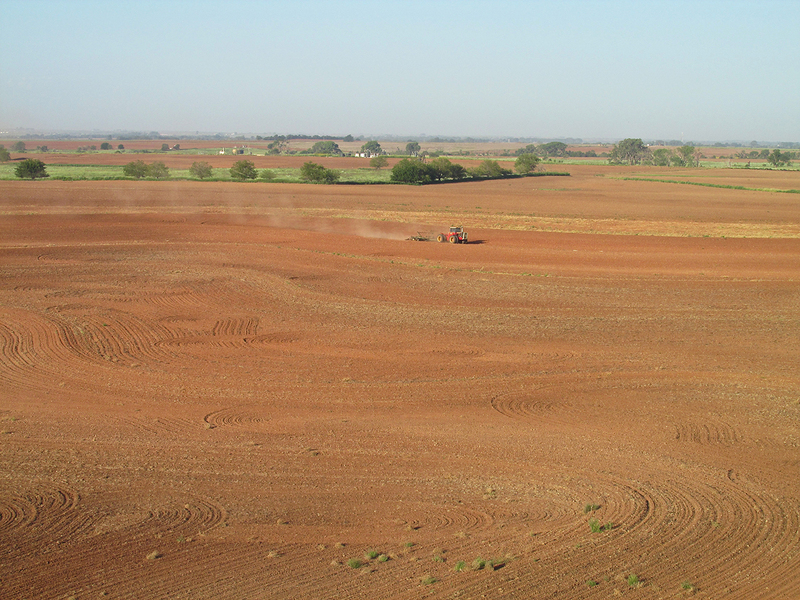 I am a bona fide, native born Texan – thrilled to be – but as far as I’m concerned the Red Dirt Moniker belongs to Oklahoma. 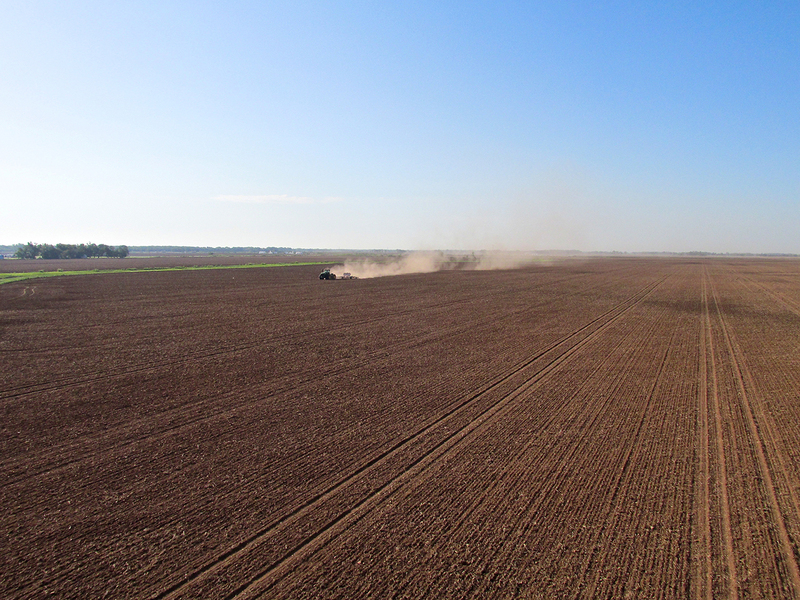 If this shot doesn’t scream “Red Dirt Oklahoma!”, nothing will. A little farther along I was fast enough on the trigger to catch the last two deer of an eight count herd sprinting across my path. 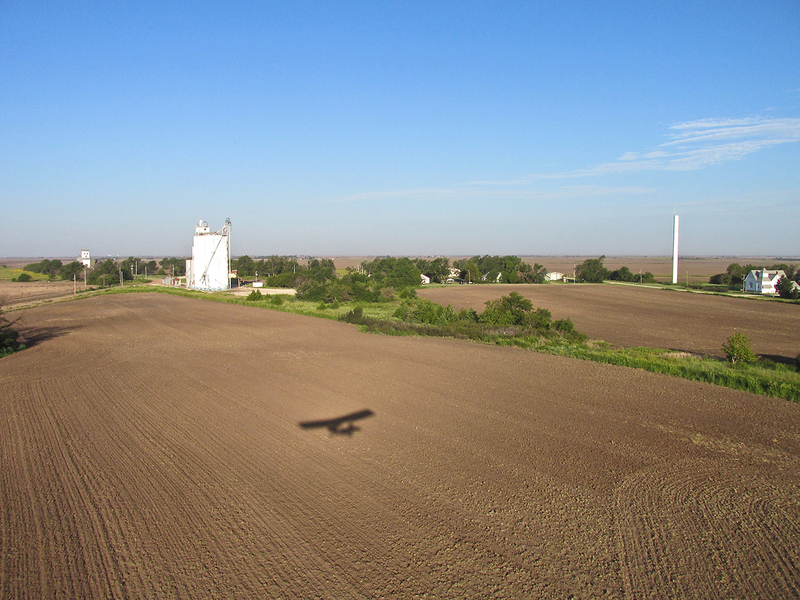 Still hugging the earth, I passed this little village South of Anthony, Kansas. 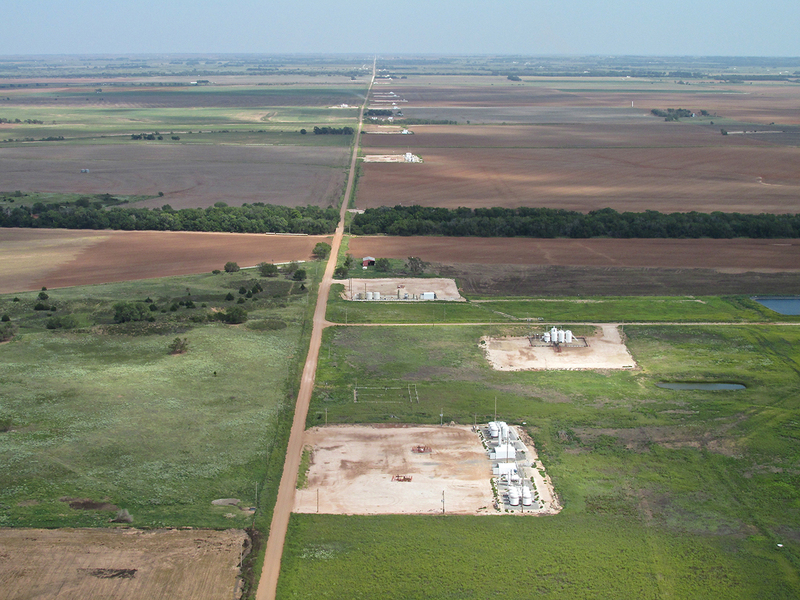 This is looking South Southwest from 50′ AGL. The same village but closer. In the background you can see the white, evenly spaced lots going left to right. I believe these have to do with horizontal oil drilling. 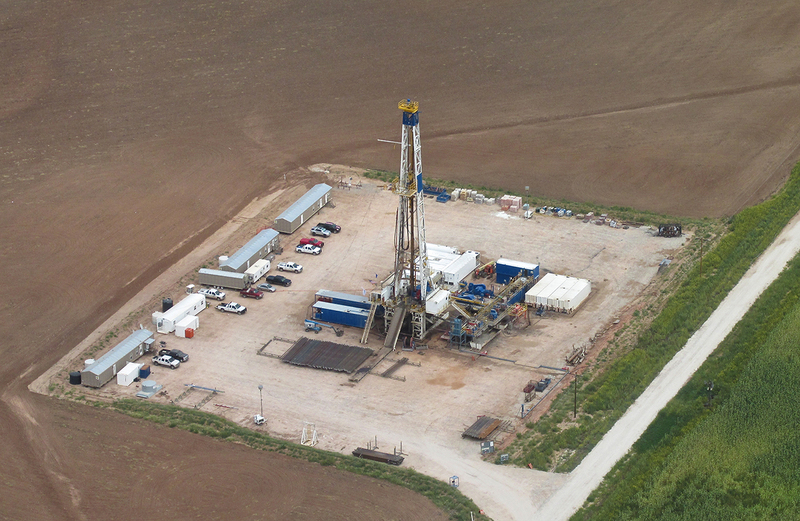 As if on cue, after noting the drilling pads in the photo above, next I see an active drilling rig. 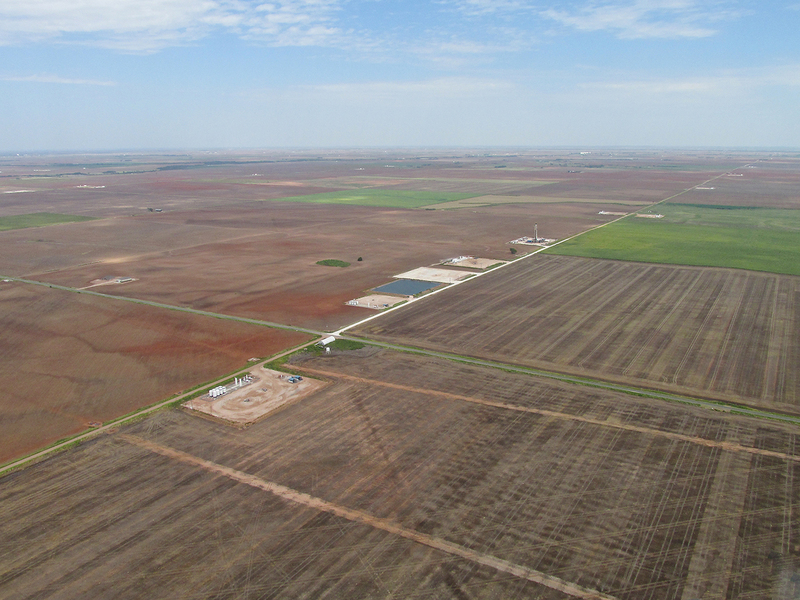 The area South of Anthony, Kansas in particular, and much of the land along the border between Kansas and Oklahoma in general, has seen a great influx of Big Oil drilling operations over the last 3 years. The talk has been of horizontal drilling and “fracking“ although due to general industry secrecy, production facts are hard to come by. Environmentalists present the impression drilling for oil is synonymous with wholesale destruction of the environment. Anyone in our region willing to pay a minimum of attention to the matter can plainly see that is just not true. 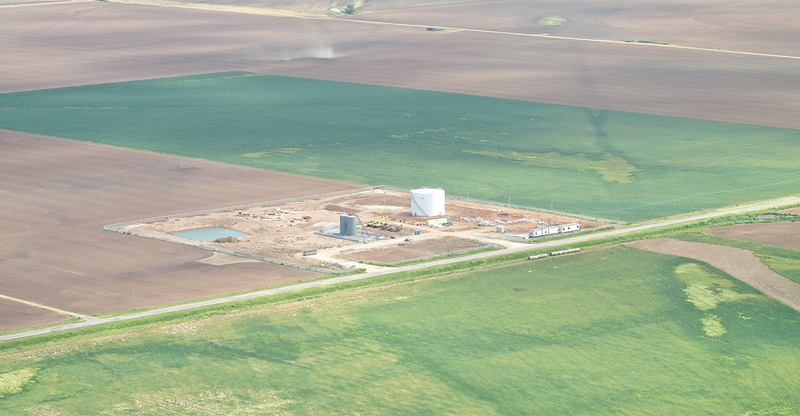 In the previous two photos you can see the earth has been plowed around and right up to the edge of the well site. 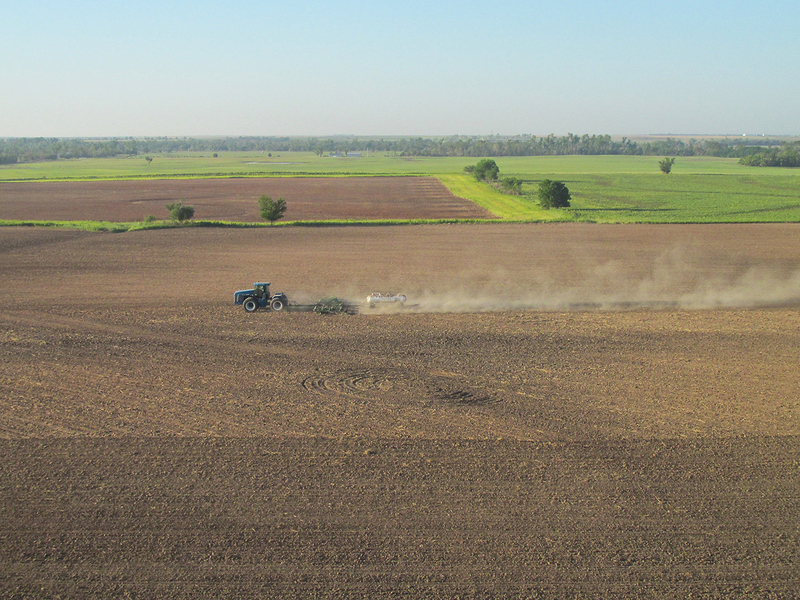 Not long after this picture was taken, this land will be planted and crops raised. The two industries work quite well together. In fact, my friend Farmer Gary Foster says the most successful farmers he knows tend to have those “rocking horse” oil pumps on their land. 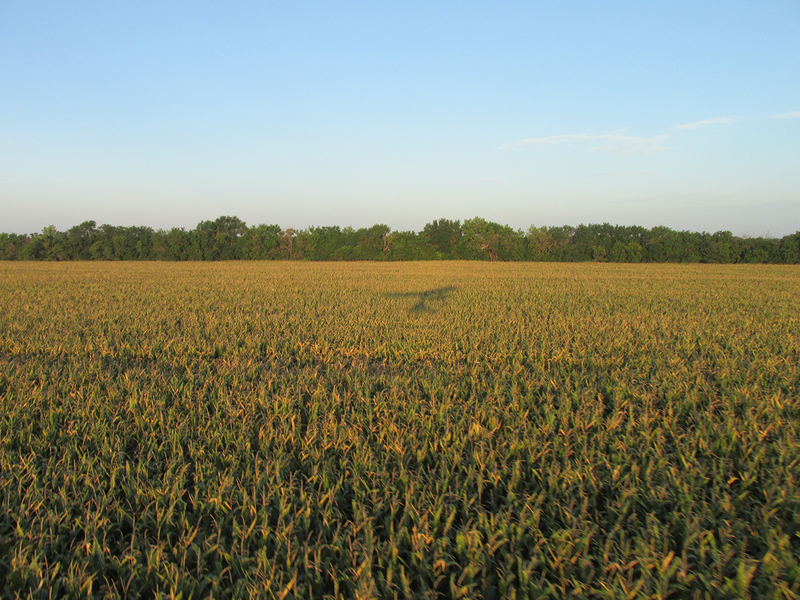 Every farmer prays for lots of them to appear on his property. They’re a good thing. 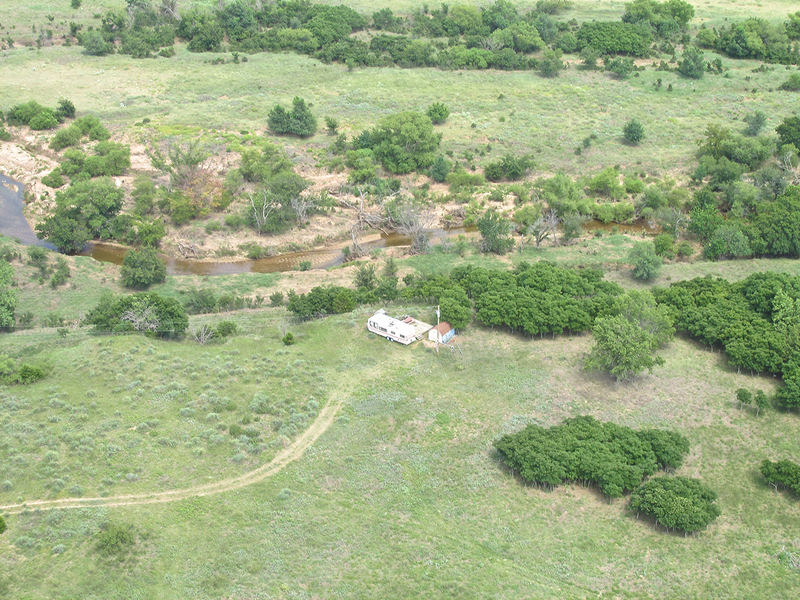 Less than a mile from the drill site. Still flying low, ahead I see a wide band of trees. Judging by the time I have spent airborne, I know I should be seeing Alva soon. 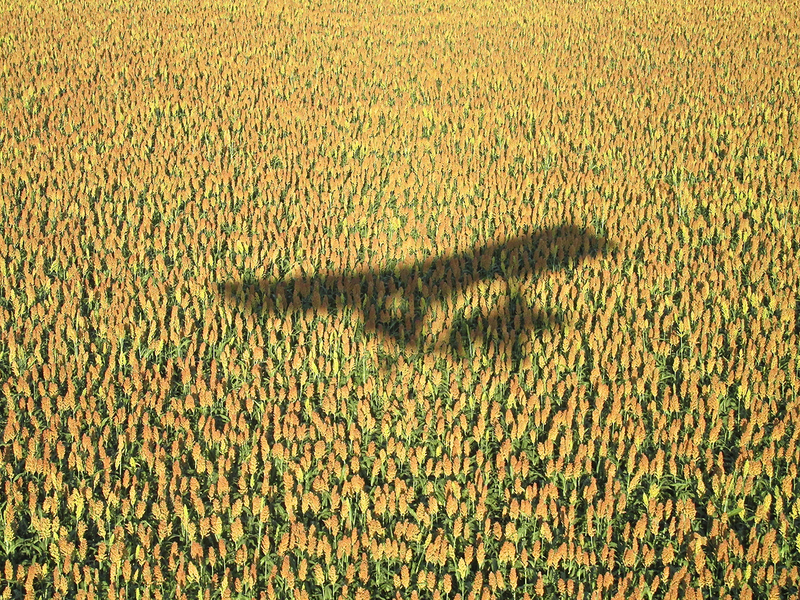 Because I don’t know if I am coming to a wide forested area, I gain altitude in order to increase emergency landing spot availability should I experience an engine failure. As I do this I see the scene below. 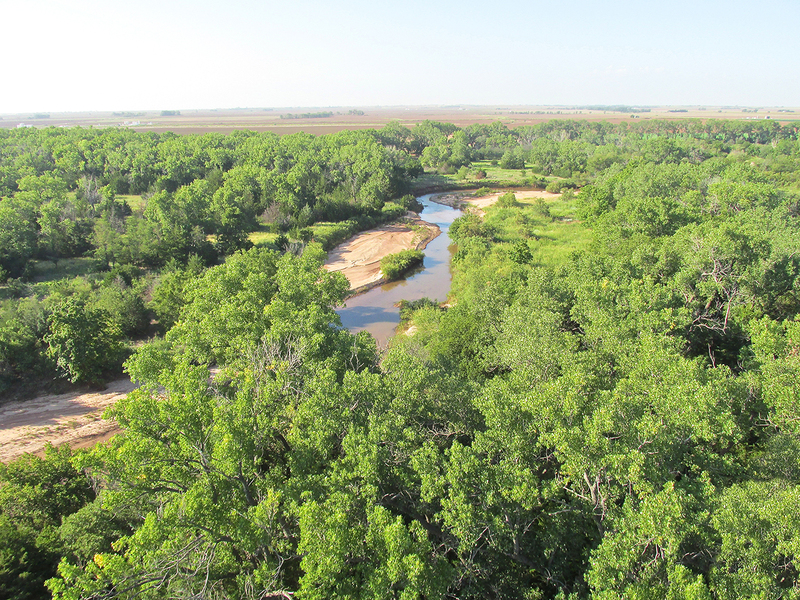 The trees are thriving at this point on the otherwise tree-sparse plains due to the abundant water provided by the Salt Fork of the Arkansas River. 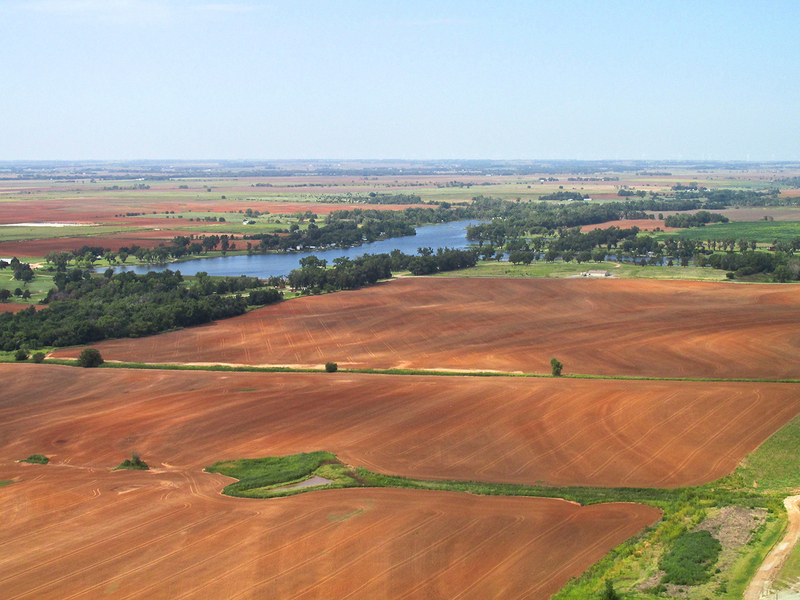 From the direction I am arriving, The Salt Fork made a Gateway to Alva, Oklahoma. In the distance I see it unfurled gracefully astride the red dirt, a long container train slowly working its way through town from the Northwest. 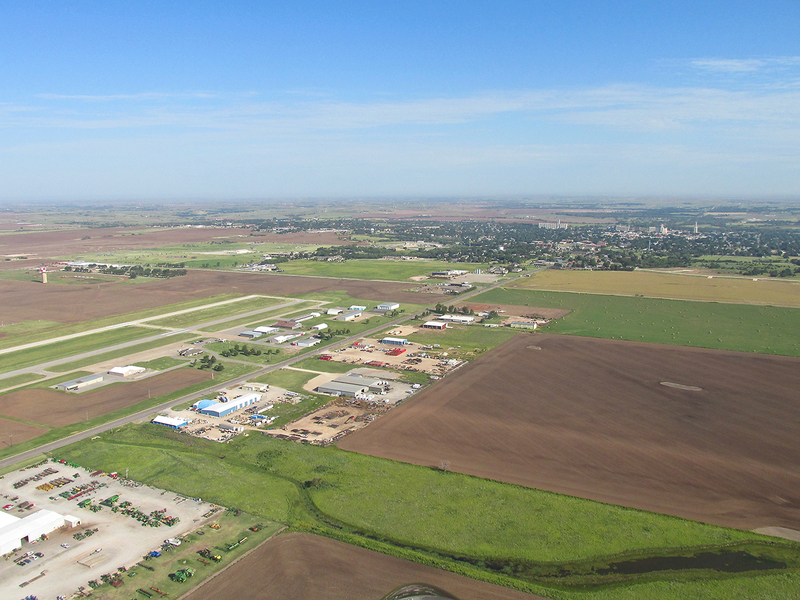 Just after taking the picture above I shot this of the Alva Regional Airport which is 1.5 miles South of the center of town. 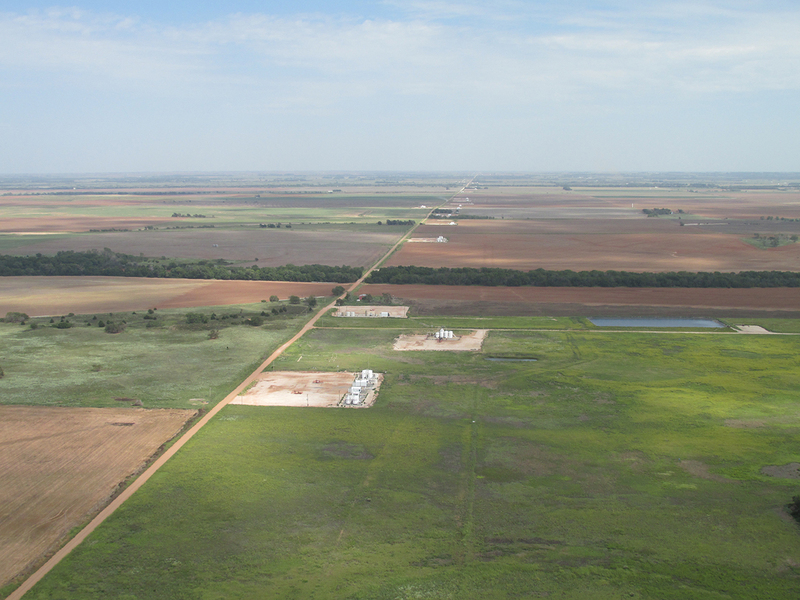 We are looking West from 1,200′ AGL. One last photo before entering the pattern, this to show the relation of Alva Regional to the city. 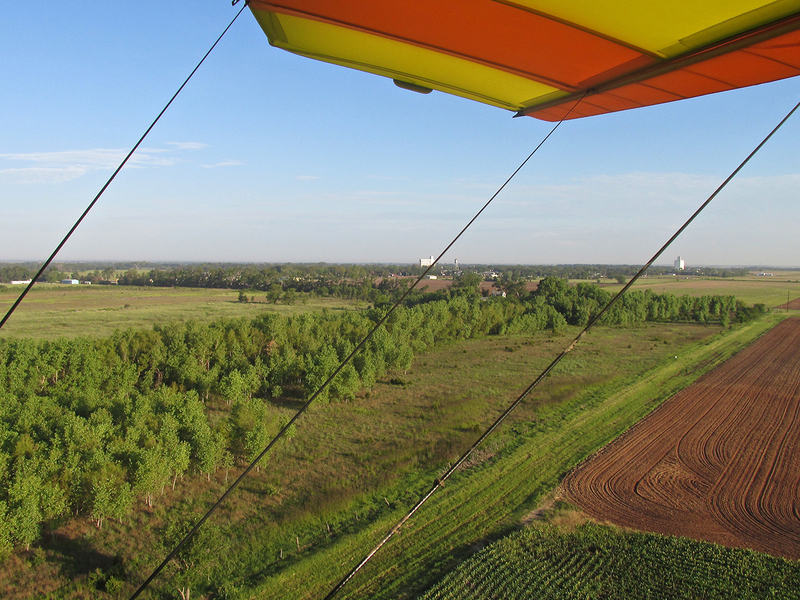 1,200′ AGL looking Northwest. OK. One more shot… The pattern was clear… I had to take this “center cut” shot of the city from the South. Just after exiting the active runway, taxiing toward the terminal building I snap this. We are looking Southeast. 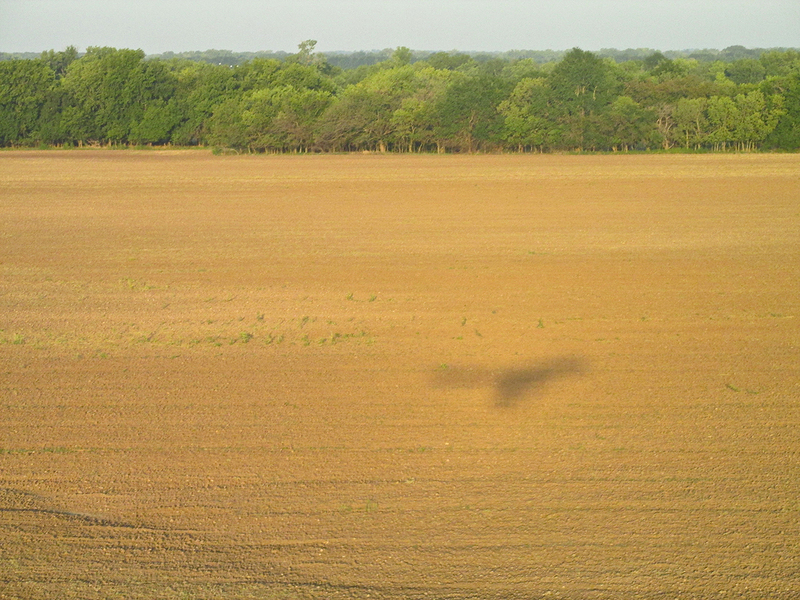 While tying down my plane I notice a John Deere Tractor bearing down on me from the South. Since it was trailing a large grass cutting rig it was blazing along at walking speed but its size made it seem faster. 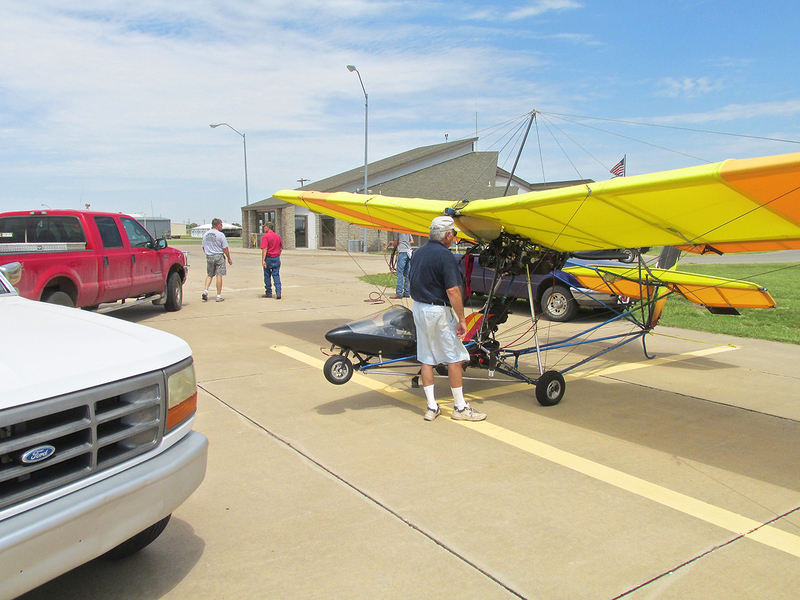 Finally it pulled up to the lawn adjacent to the terminal building and Mike Degan jumped out with a smile. “You’re the Ultralight guy! 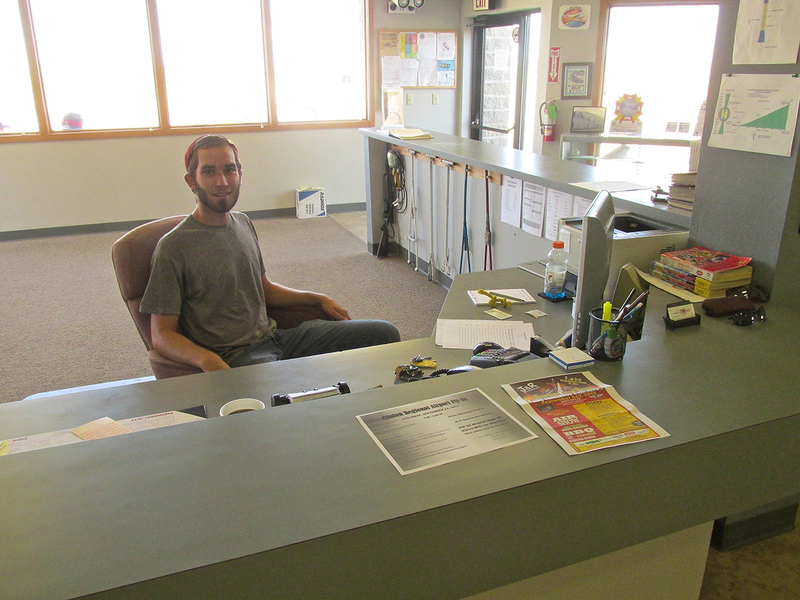 Greg (Murray – the airport manager) said you would be here today. Do you need anything?”, he said in quick order. I had called and talked to Greg Murray the day before to check on fuel and procedures. He said he would not be working on Saturday but had a good man to handle everything. That was obviously the case. Mike told me he was a Psychology Major at Northwest Oklahoma State University (NWOSU – The Rangers) and that he wanted to help people rid themselves of the burden of substance abuse (what we used to call drug addiction). I was immediately impressed with his forthright attitude and plan of action. It was apparent to me that he was not just “hanging out” through college but was on a mission. I like that a lot. He invited me into the Airport Terminal Building. I backed up against the South wall to take in as much of the expanse of the main room as possible. As you can see, it is a very attractive and functional terminal with a suitable aviation flair. 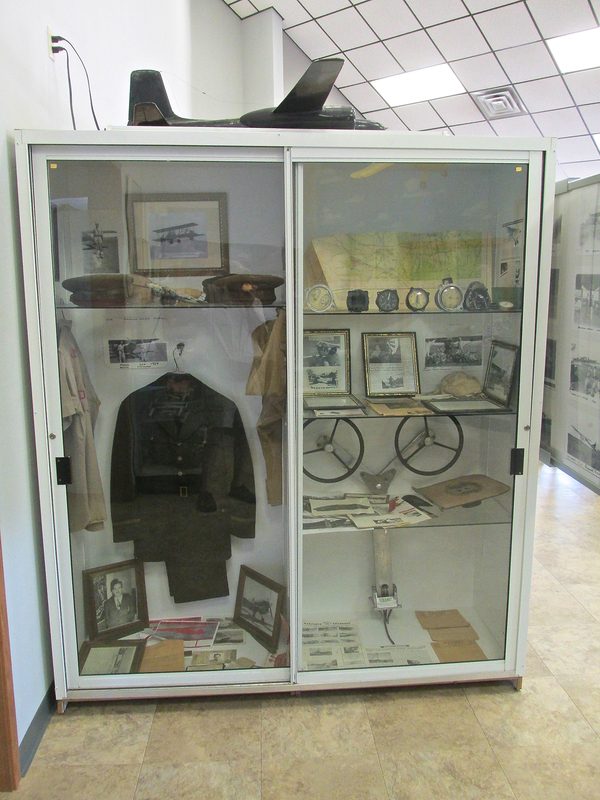 A display of Aviation Memorabilia at the terminal. There are more displays like this in the building. I am quite content to walk into town when I arrive at the airport of one of my Fun Flight Excursions. I am thrilled when some of the airports have a loaner car you can borrow to drive into town. Generally they are old “beaters” but they still get you around faster than on foot. Alva Regional stepped up my “gratefulness quotient” dramatically when Degan handed me the keys to this nearly new sedan with air that blew cold. A King’s Treatment for a Pauper Pilot! 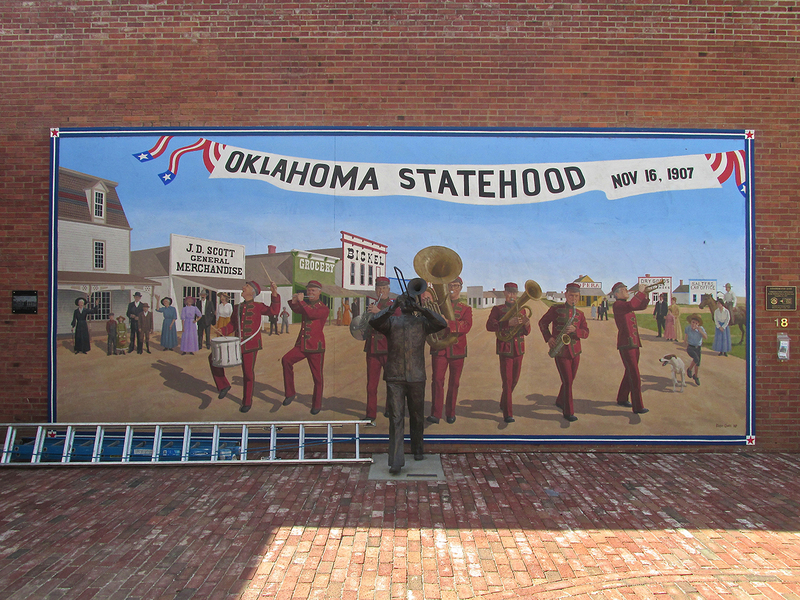 Alva calls itself “Oklahoma’s Mural Capital” but I think “America’s Mural Capital” might fit better. 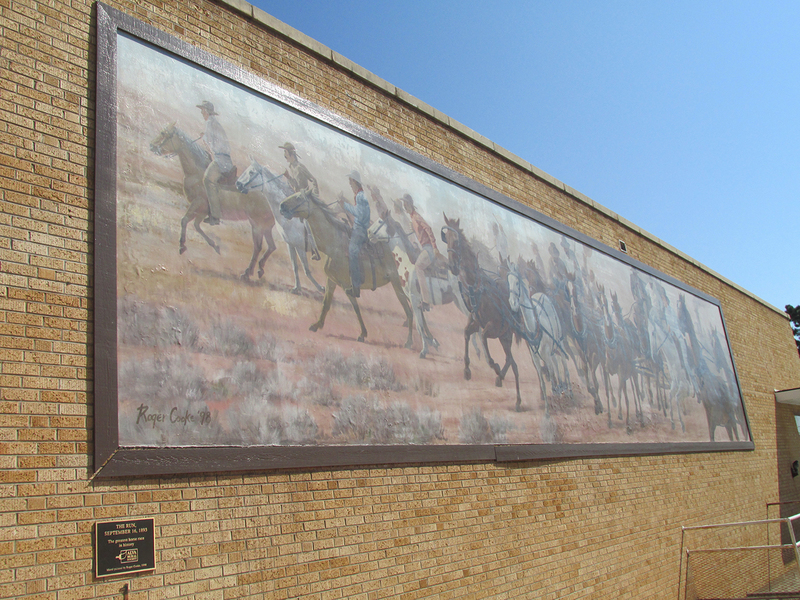 There are approximately 25 of these exceptionally large paintings dispersed around the town. 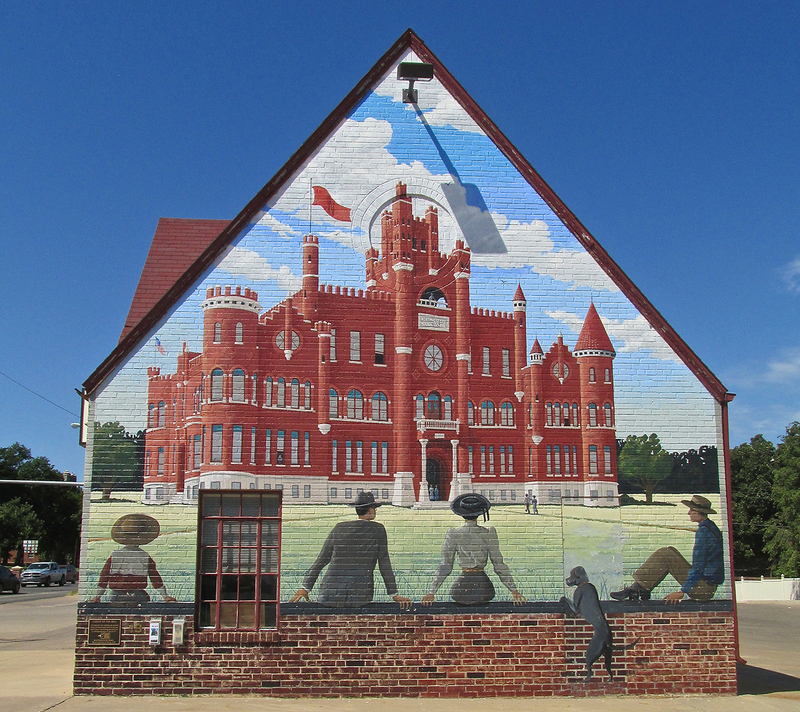 Established in 1997, the Alva Mural Society has commissioned a variety of mural painters to represent the history of this region. I like them a lot. 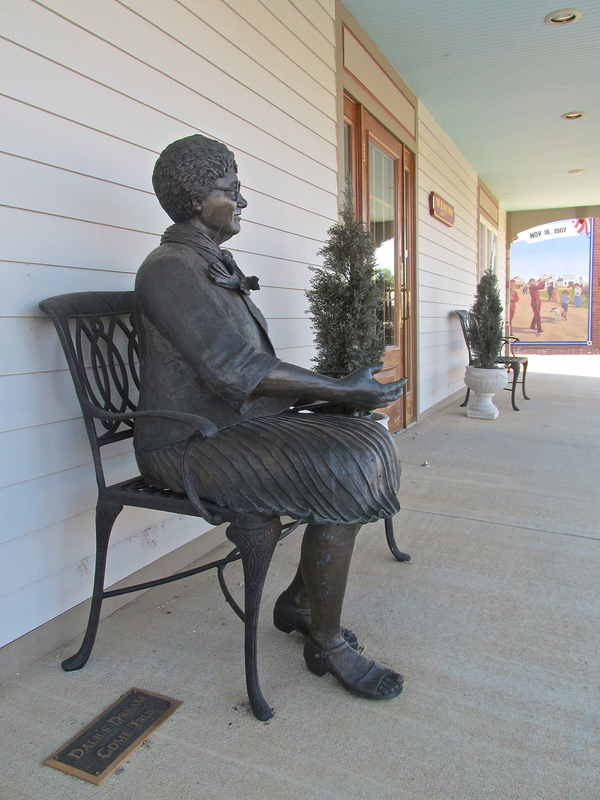 They add greatly to the character of the town. 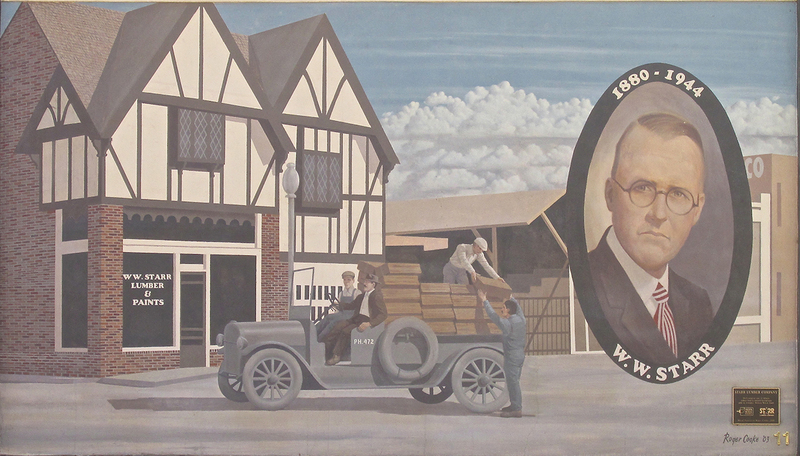 The mural society provides a nice brochure with mural thumbnails and a map to find them. I took pictures of as many of them as I could but did not have enough time to find all of them. For some of the scenes, I wish I could have done a better job. In those instances, I would rather have had the sun at a better angle and the cars out of the way, a ladder to stand on, etc. That is what I notice. But, in general, I think they are good enough representations that you might want to go there and see them yourself. 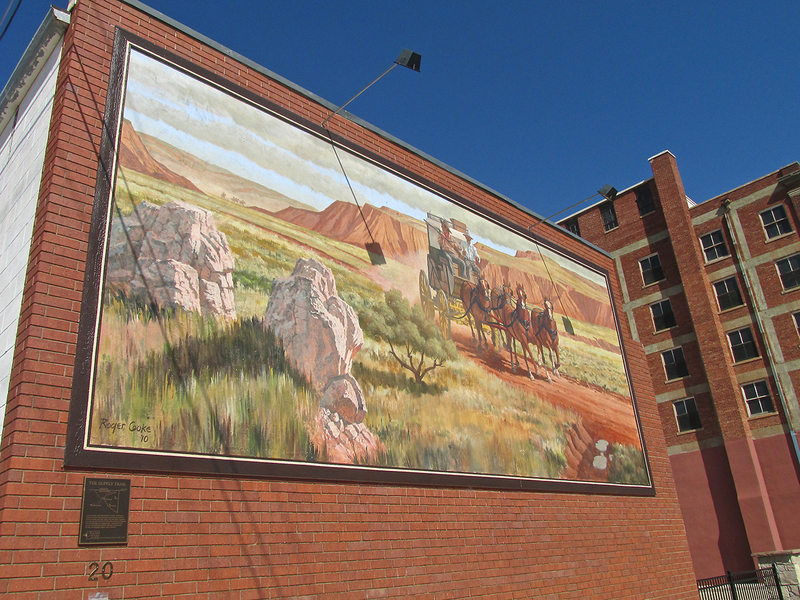 Along the way, while tracking down as many of the murals as I could, I stopped to photograph interesting buildings, too. 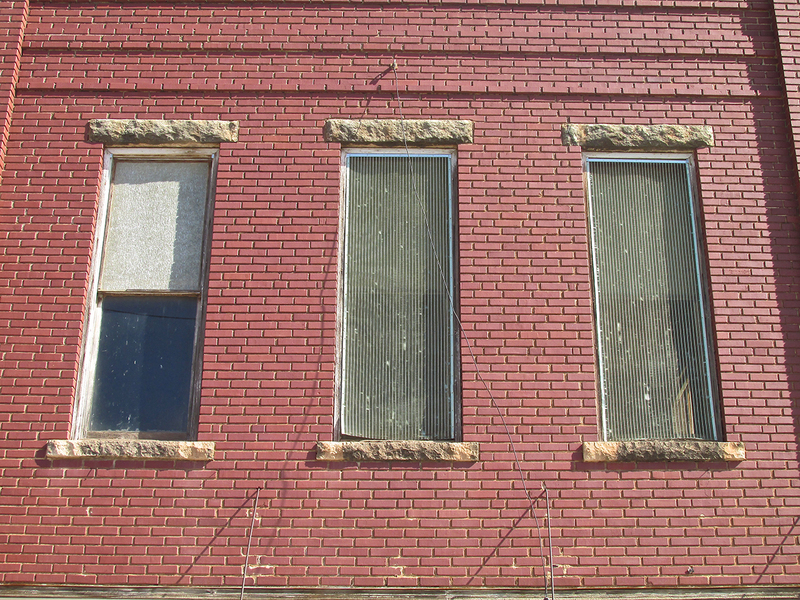 I like the stone caps and bases on the windows of this brick building on Flynn Street. 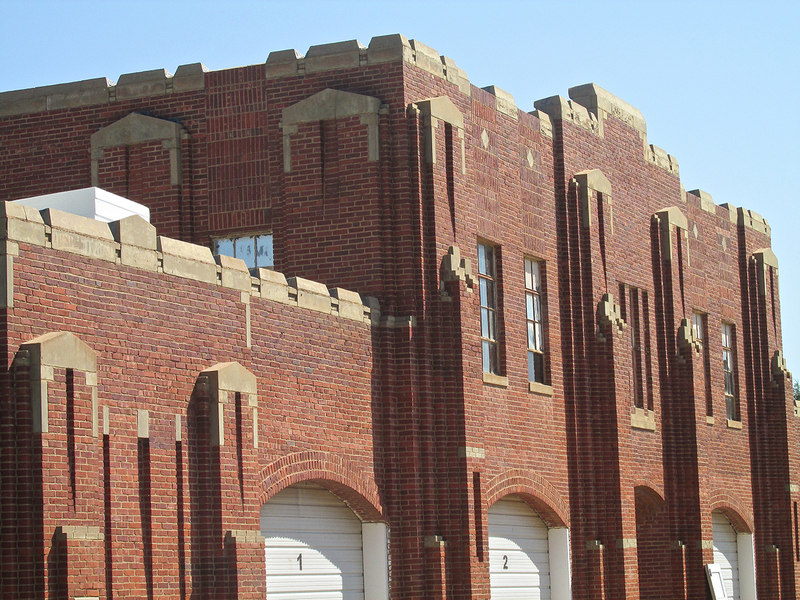 This building is a restoration project of great significance. 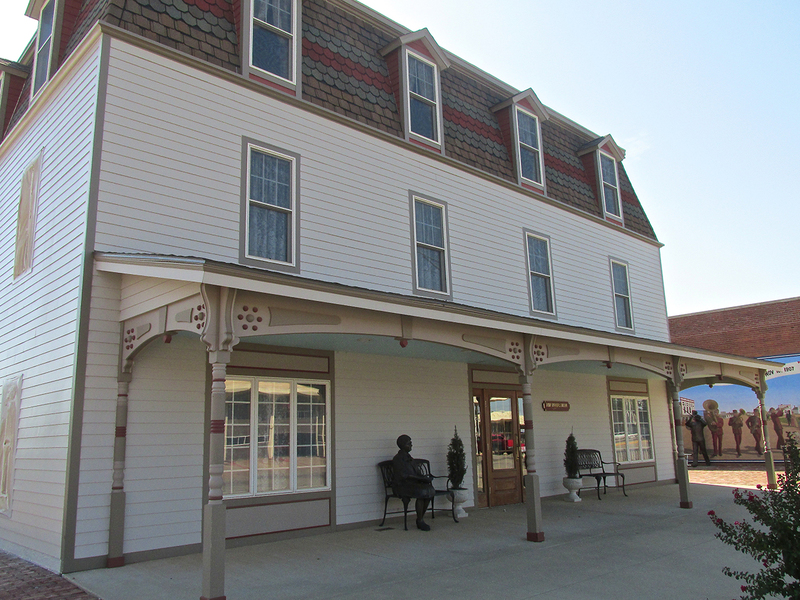 In 1893, the entire building was moved from the now defunct town of Runnymede, Kansas. After a while it fell into disrepair and remained that way until its rescue in 1998 by a citizen’s committee. You can read more about it HERE. 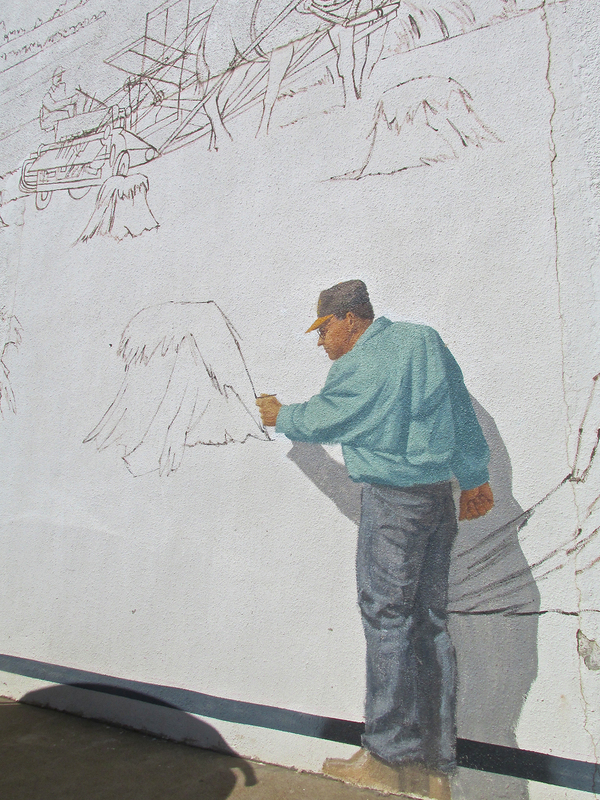 The subject matter of this mural is obvious. If it is not obvious by my photo, the artist, in addition to painting a fine mural, has “broken the forth wall” by including a statue leading the band (the ladders aren’t part of the display…). 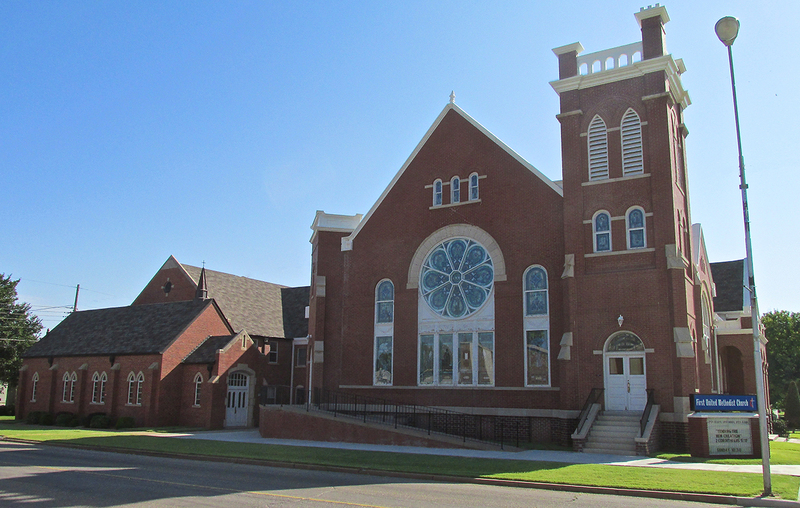 Charles Morton Share – Son of Pioneer Merchants – Active in the Presbyterian Church. 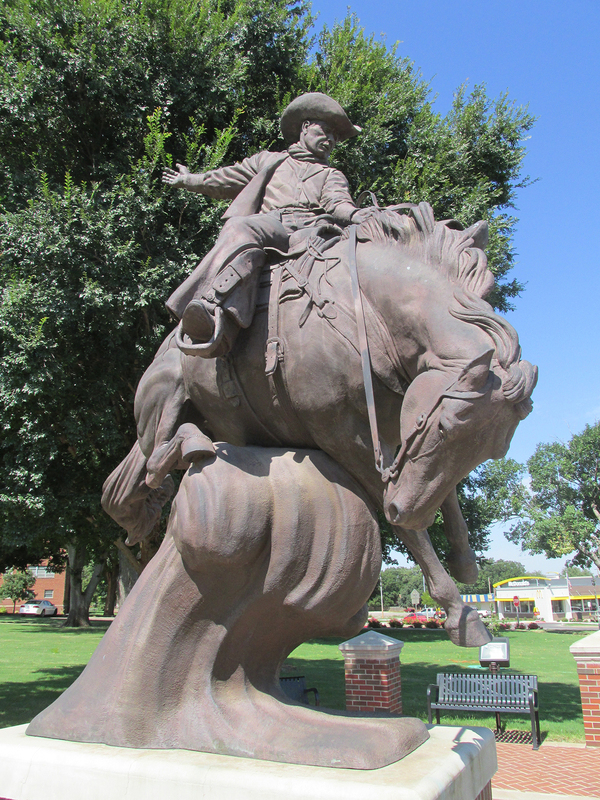 He established a Trust which funded the Library, Hospital, Professional Building, Wellness Center, Correctional Center and many other worthwhile projects in Alva. 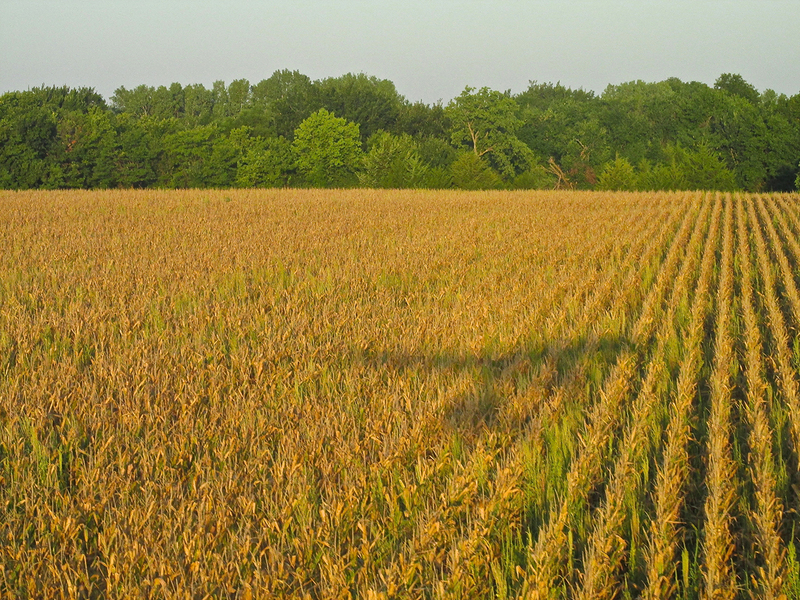 An early 20th Century Wheat Harvest in Woods County, Oklahoma is portrayed. 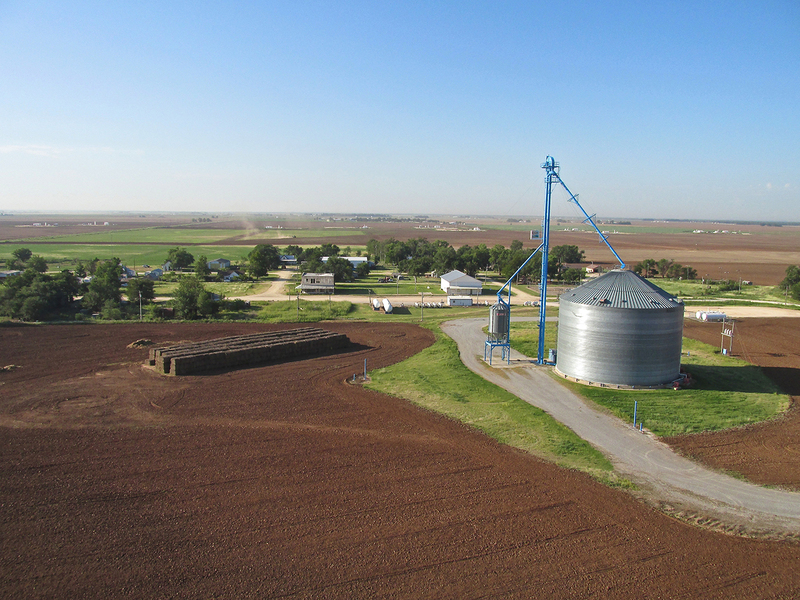 Across the street is an adjunct to the harvest, another creative “forth wall breaker” featuring a steam powered threshing machine. 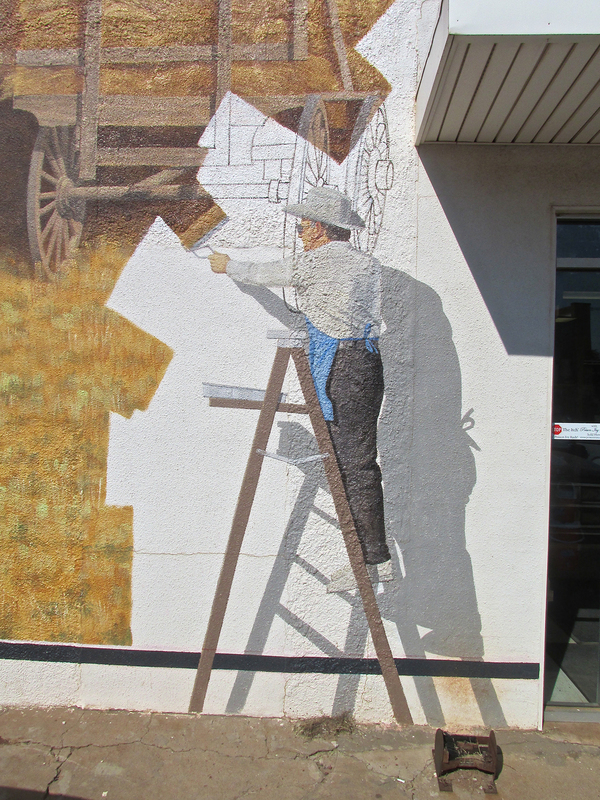 A work in progress, I was able to photograph the painters in their labors. 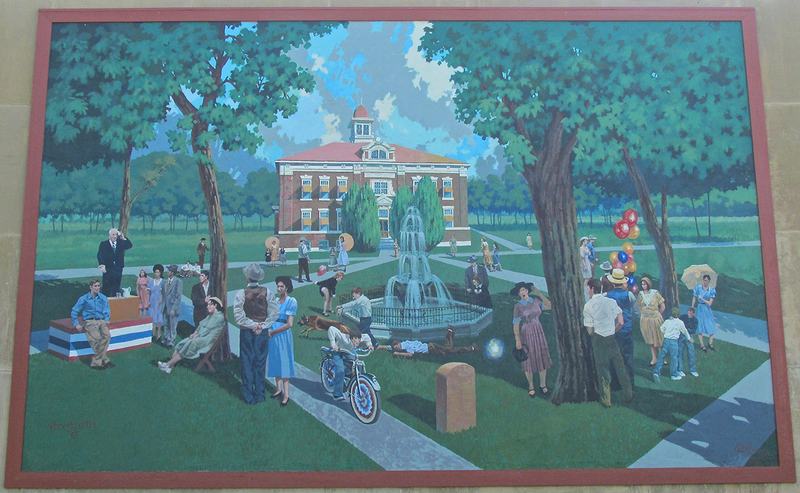 Years ago I had heard about this but the mural brought it back “front and center”. 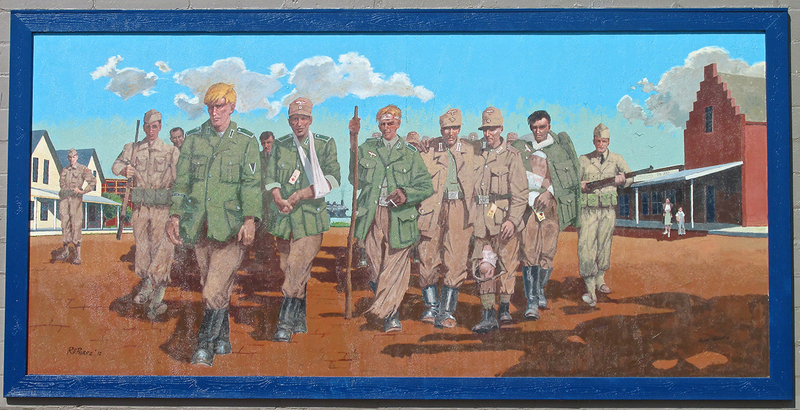 In World War II, Alva hosted a Prisoner Of War (POW) camp for the incarceration of “high value” Nazis. This mural documents that. 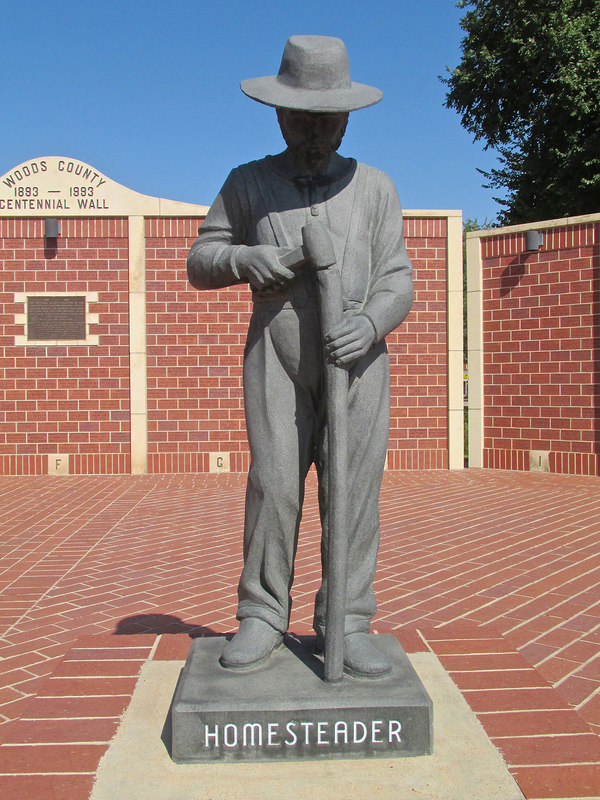 To commemorate its first Hundred Years, Woods County erected this wall with its representative settlers. 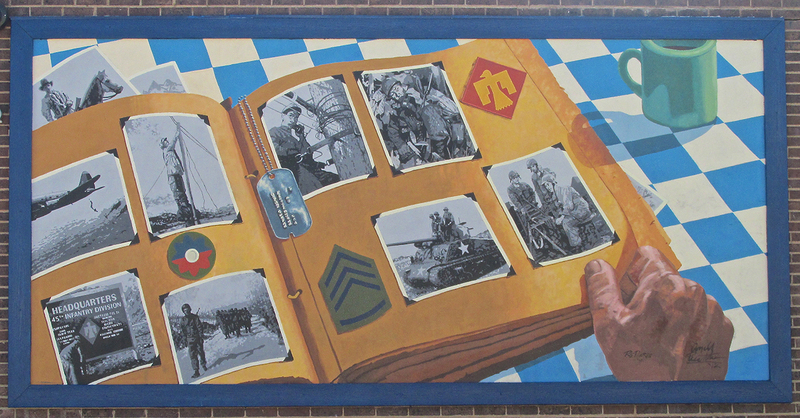 The 45th Infantry Division (The Thunderbirds) was established by Congress in 1920 to be comprised of soldiers from the four states of Oklahoma, Colorado, Arizona and New Mexico. 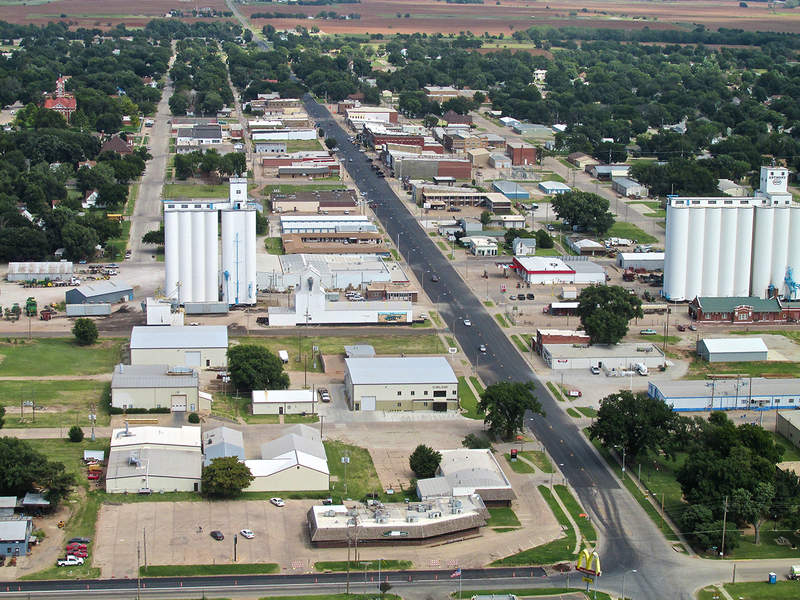 Alva is the second town I have seen a reference to this famous fighting force. 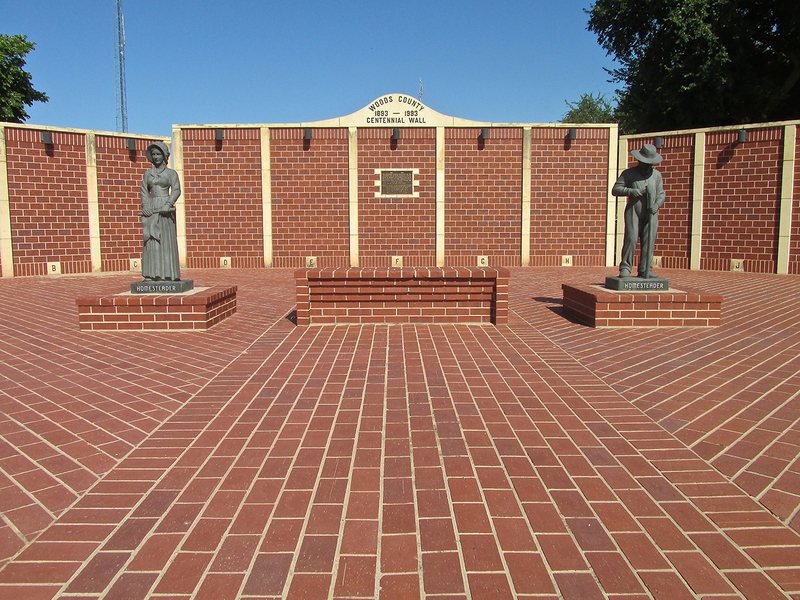 Pawnee, Oklahoma also has a tribute to it including a howitzer and fallen heroes memorial. I took some pictures of it HERE. This next mural reflects the sad day “The Castle on The Hill” burned down. 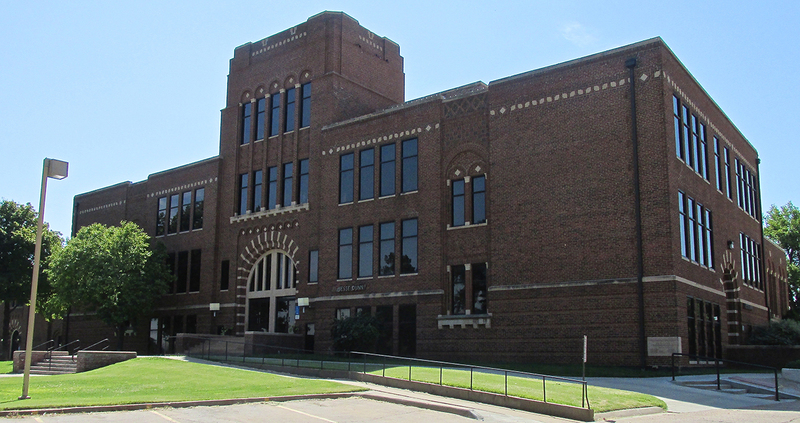 Dedicated in 1898, this impressive building was the home of the Northwestern Territorial Normal School. 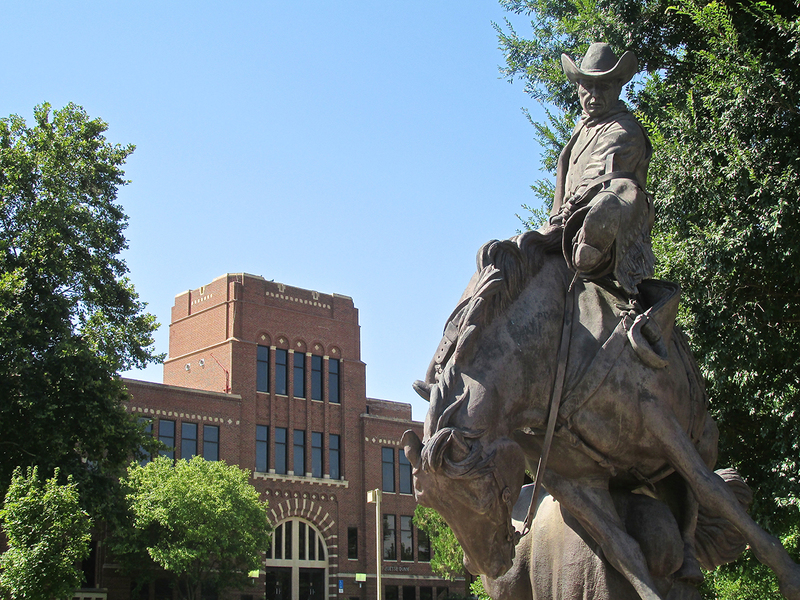 “Normal School” is the antiquated term for what we now refer to as a “Teacher’s School”. 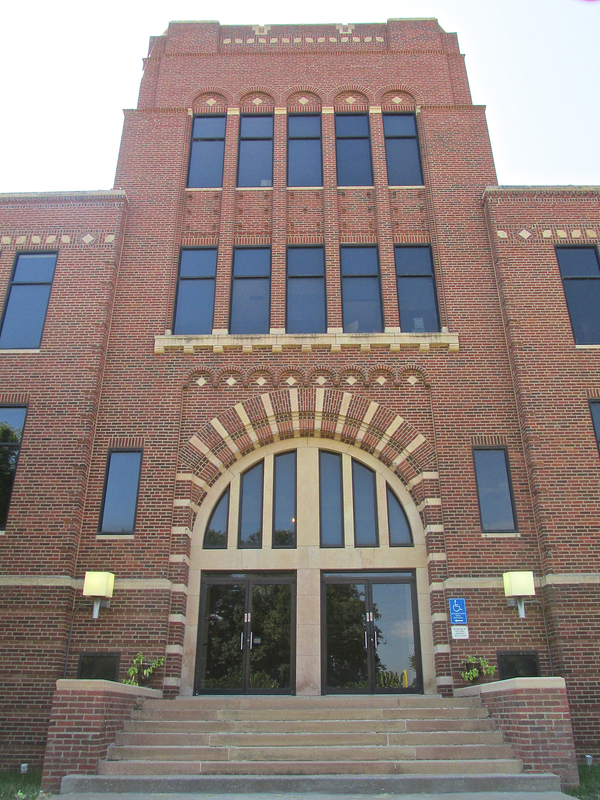 After the fire, the building was replaced by the Jesse Dunn Building which I will show later. This gives you and idea of the setting of this “Wild West” action piece. 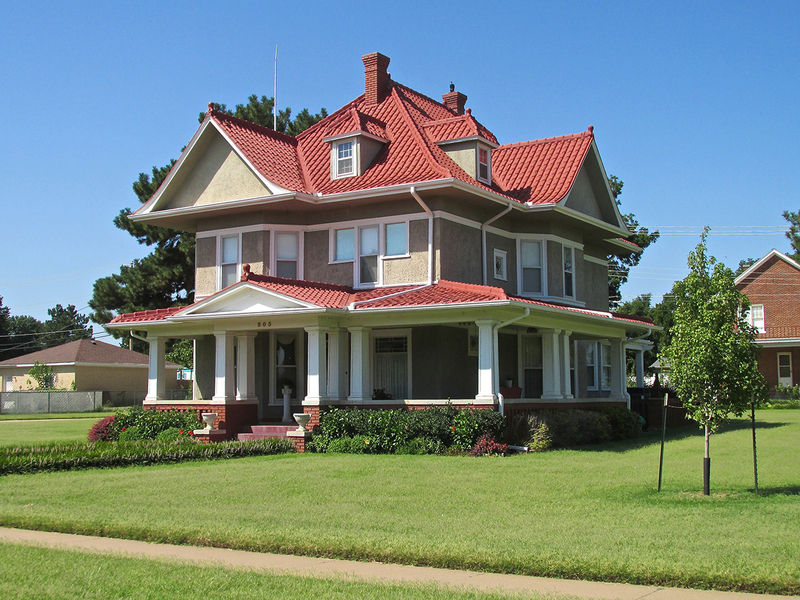 The Corner Of 6th & Barnes Street – You have to like a place called “Happiness House”. 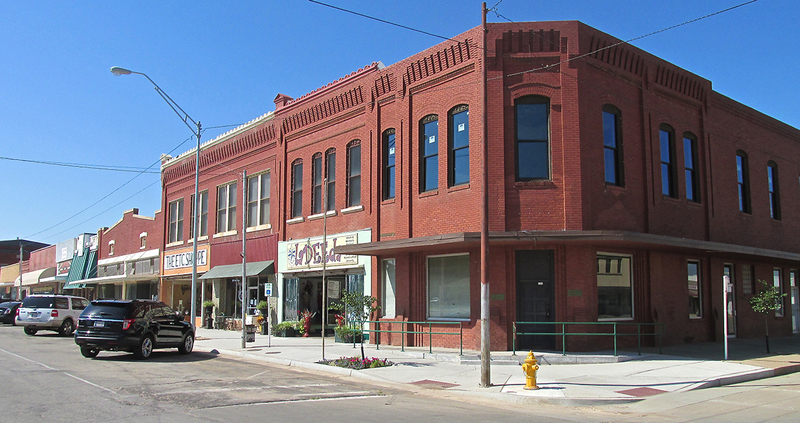 Flynn Street Looking East – The corner building reminds me of the 50’s. The next corner farther West on Flynn features another attractive monument to architecture of the middle of the 20th Century. I think they keep Fire Engines or other City Vehicles here. Nice Masonry! 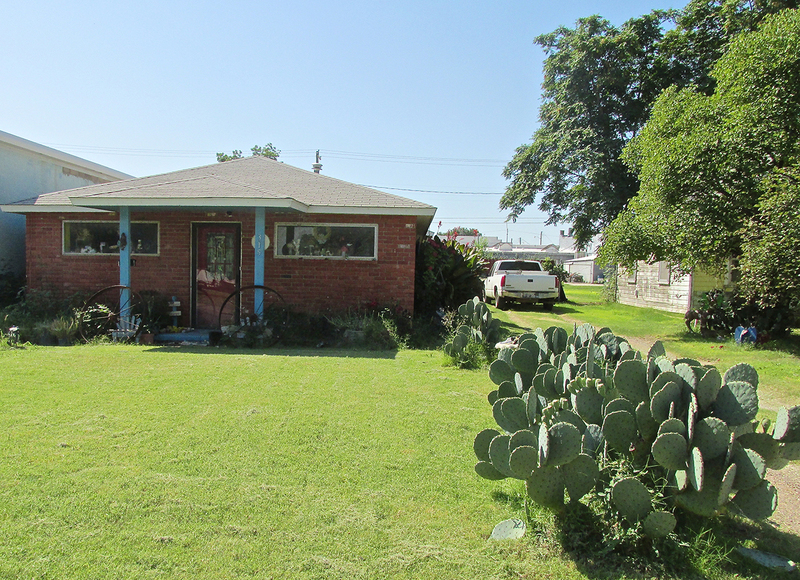 What a fine yard entry. Earlier I mentioned Mike Degan attending NWOSU. 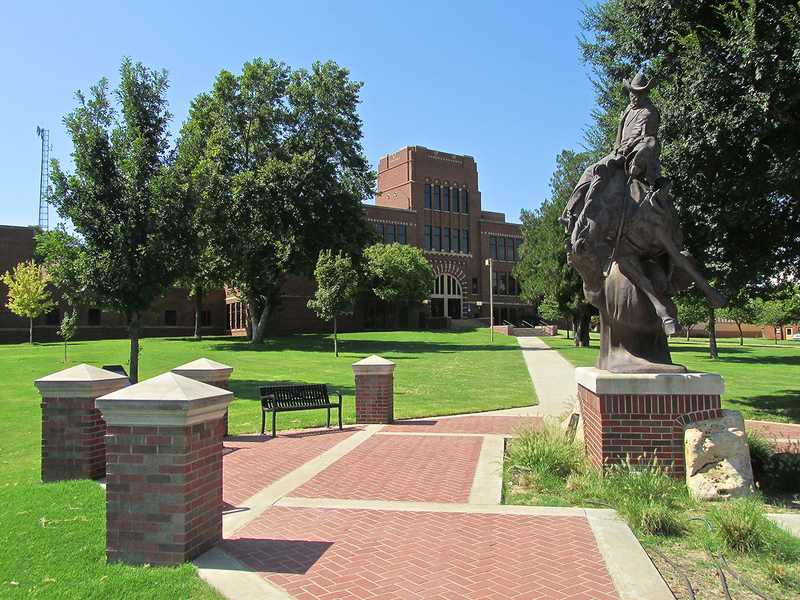 Quite an attractive campus, I took some pictures around its North entrance. 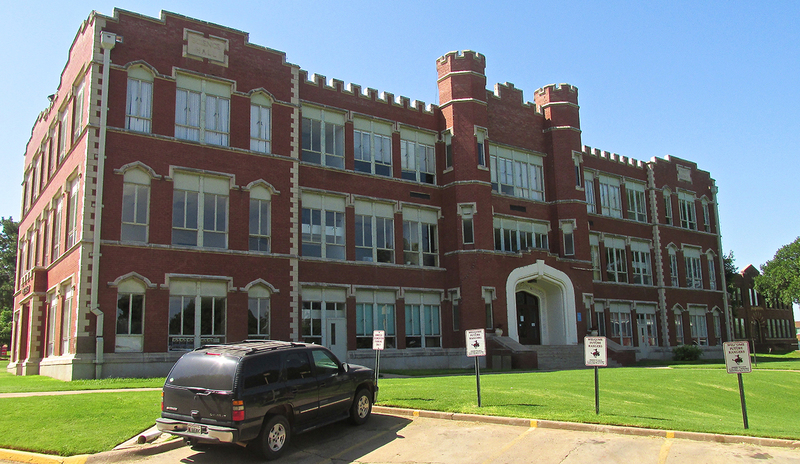 Jesse Dunn Hall – The replacement for “The Castle On The Hill” shown earlier. People that attend and graduate NWOSU are called “Rangers”. 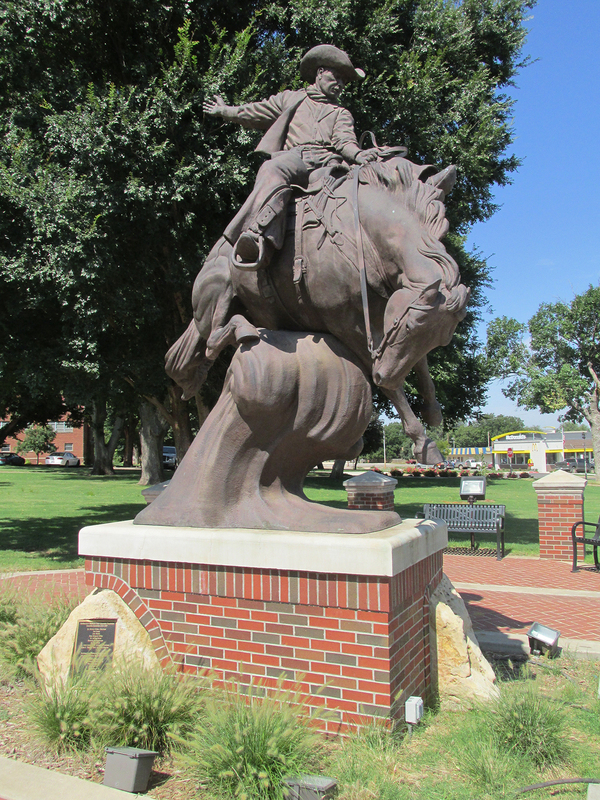 I liked this Ranger statue so much I took a number of pictures of it. This statue is impressive, inspiring. Uplifting. A superb entrance to a college! 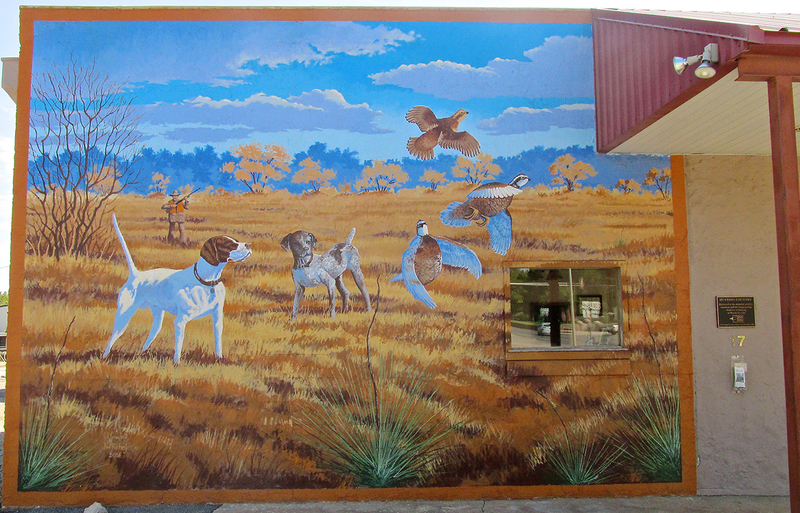 On the side of a bank we see that this is “Hunting Country”. 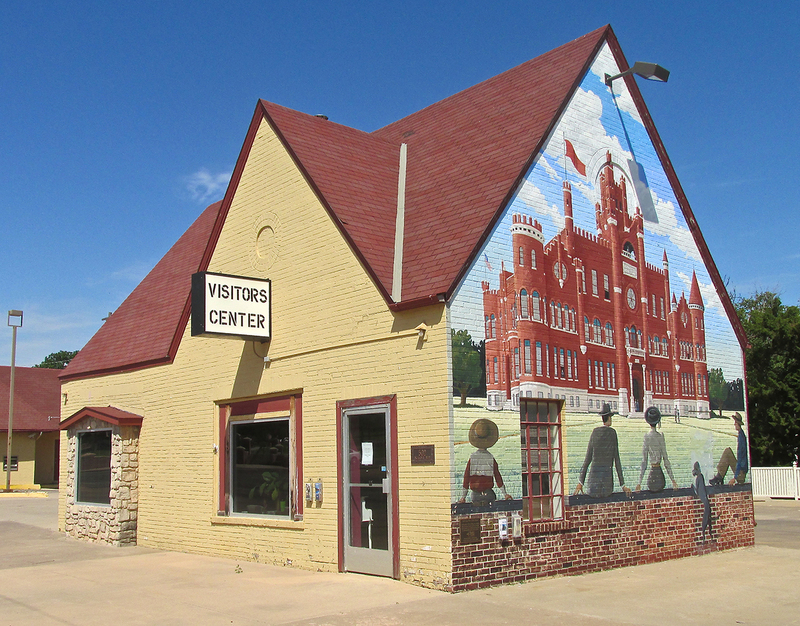 The Alva Visitor’s Center features a glorious rendition of “The Castle on The Hill”. Even though The Sky Surfer thinks he needs nothing but “good air and great scenery” to survive, like the mortals he glides above, he must eat to survive. Just after “the car key handoff” with Mike Degan, Surf queried him as to a good local bistro. 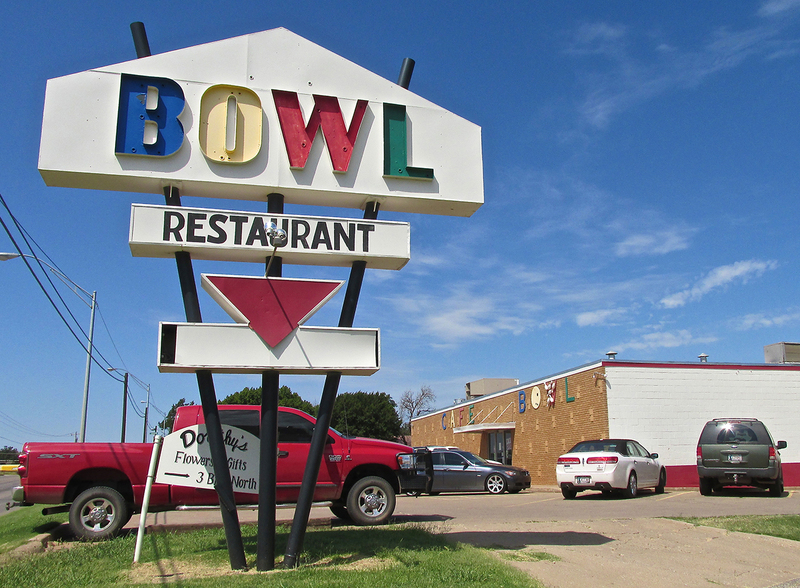 “The Bowling Alley” was his flashback reply – Not a moment’s deliberation or a second choice. Gracefully nodding his head, the Seasoned Surfer pondered if his culinary tastes would mesh with those of a youth forty years his junior. Sensing hesitation Degan assured, “Really. They have the best burger. It’s easy to find. Just look on that street in front of The College”. Wanting to be accomodating but still not certain, Sky smiled, thanked him for the suggestion, wheeled on a heel, and set off picture taking. About two hours later, dazed from 100+ temperature and constant hustle, the Bowling Alley Burger Bar gained credibility in The Surfer’s psyche. 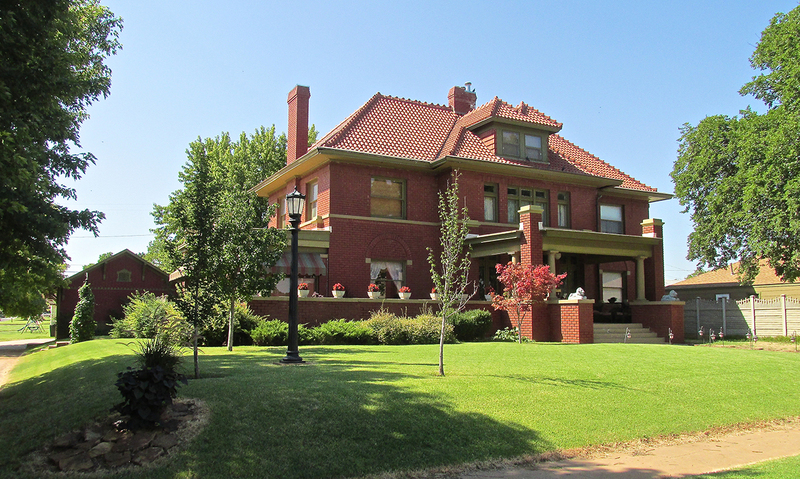 Heading West on Oklahoma Boulevard, his eyes beheld a sign that closed the deal. When I was young, left to my own devices I would have been content to live on Pie, Cake and Cookies. Mom wouldn’t hear of it, though, and always made sure I ate “well balanced meals”. Conditioned by this upbringing, I entered the diner with every intention to order a regular lunch consisting of the acceptable food groups. Across from the counter, though, were four or five of those “lift up” glass things that cover pies. 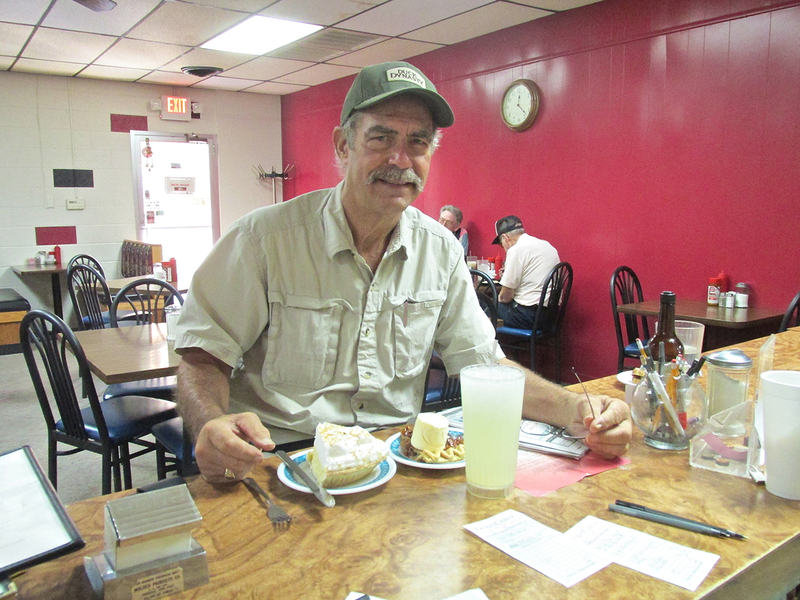 I found that even though my mind wasn’t thinking it, my eyes kept straying from the menu in my hands to the superb selection of pies nary four feet from my stool. This distraction kept me from comprehending the menu. After gobbling down the feast I paid up and left. Stepping out of The Bowling Alley, the combination heat and sugar shock gave me a moment’s pause. 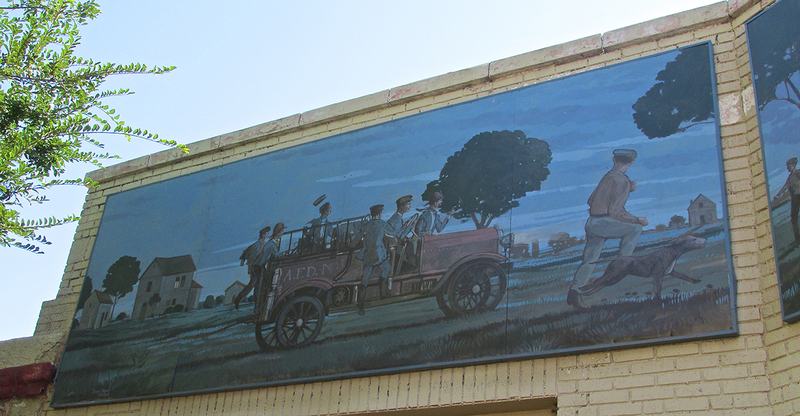 I looked at the clock and acceded I had found all the murals I could for that day. It was time to get back to the airport for a return to base. So you wouldn’t think I was whining, I recorded the official temperature that afternoon. 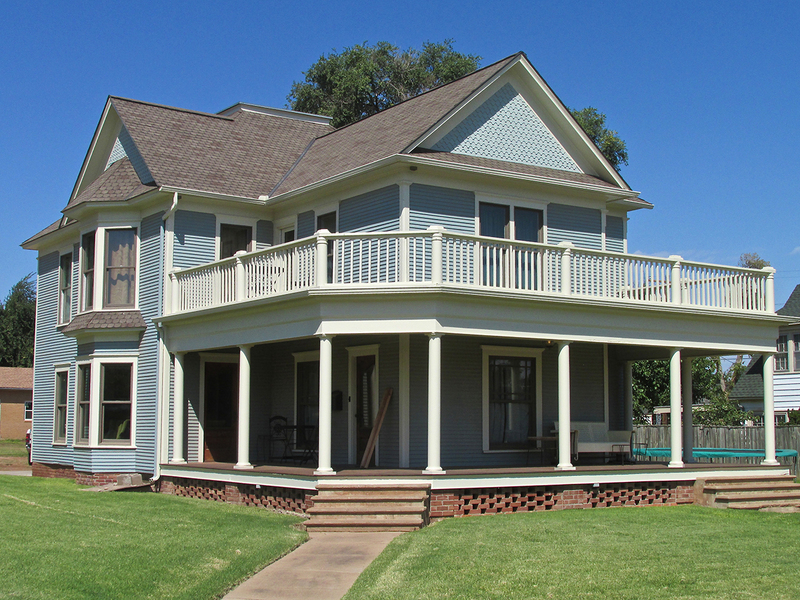 On the way to the airport I saw this nice pad on the South side of town. Perhaps you noticed the above fragment in the title to this story and found it a bit weird. Does The Sky Surfer really think a flat tire is a good thing? The answer is “sometimes yes”. Here is my explanation which follows a general Flite Blog™ Theme of returning the teaching of Providence to current use. After finishing my lunch, I stepped outside where it was getting hotter, windier and later. 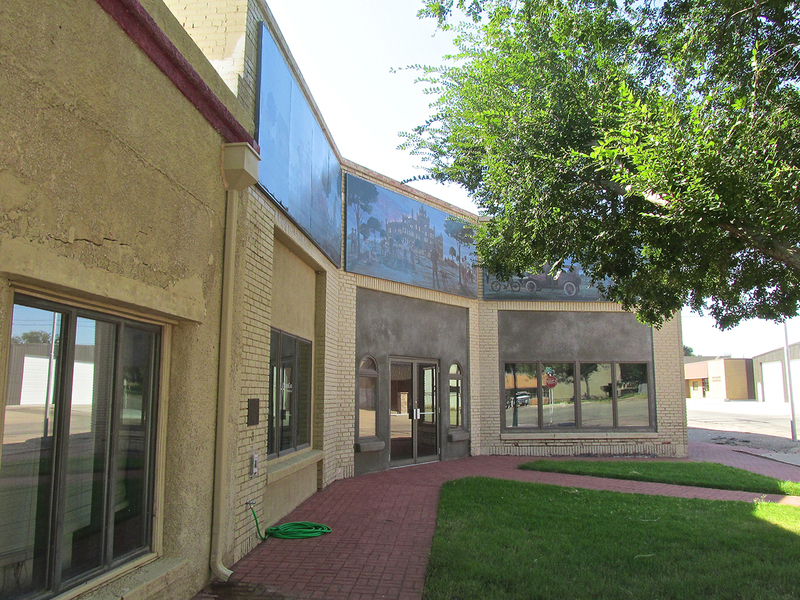 It was mid afternoon – time to depart Alva. Pulling into the hangar area of Alva Regional, I was arrested by the sight of an open hangar with a man keeping cool in an easy chair in front of a blowing scroll fan. All three were positioned next to one of the classic beauties of the airplane world – an obviously, well-maintained Cessna 190. I pulled up, rolled down the window and said, “How’s it going'”. Retired Corporate Pilot James Stallings responded, “Not bad. Didn’t have anything better to do so I came down to the airport”. Immediately sensing the presence of a kindred spirit I turned off the motor, got out and introduced myself. Hanging out at the airport on a Saturday IS the best thing one can do, particularly in the company of a such a handsome 1952 Cessna. 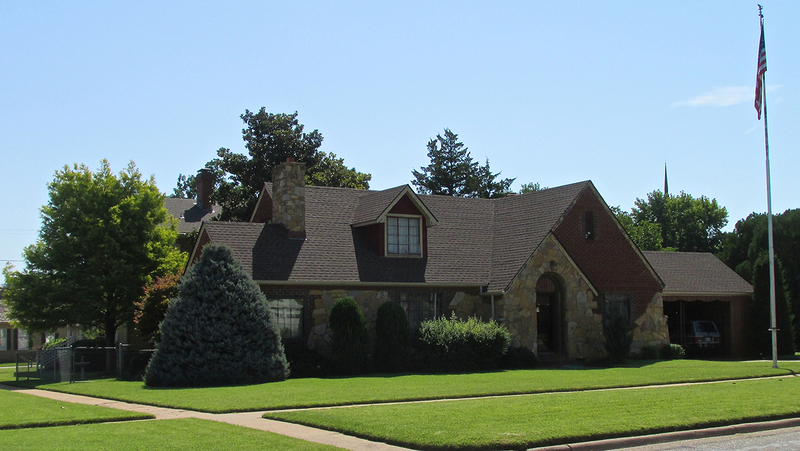 I discovered that James was retired from commercial flying and had also owned a Cable TV company in Waynoka, Oklahoma. He had owned this 190 since February of 1968. 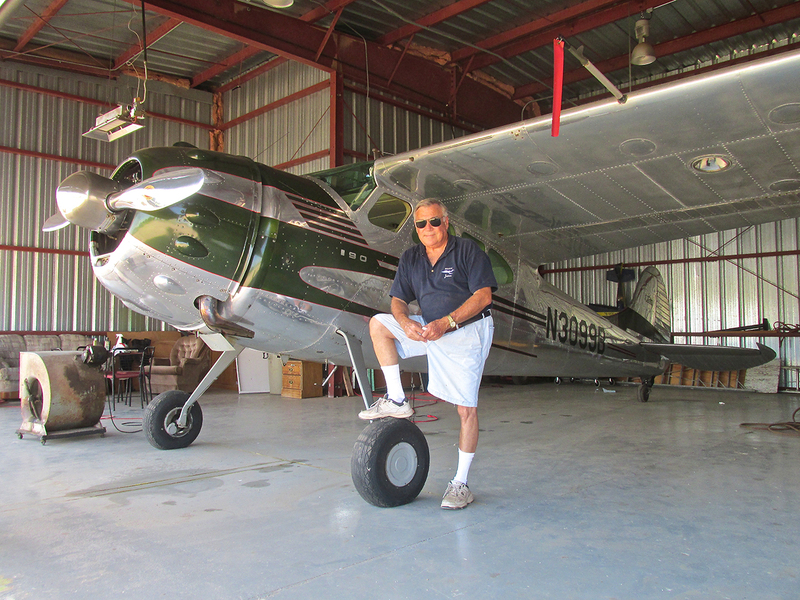 He said back when he bought the plane, nobody thought it was special, but over the years, people have begun to much more appreciate its round engine and classic lines. Recently, for my video series on Classic Airplanes, I completed an interview with Bill Koelling regarding his 1937 Airmaster, a precursor to the C-190. Cessna hit a home run with this line. 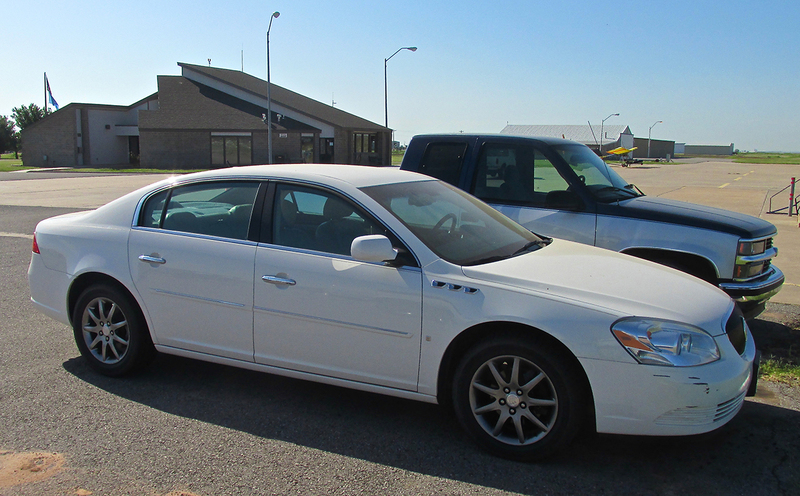 Recognizing the “loaner car” I was driving, James asked what I was doing in Alva. 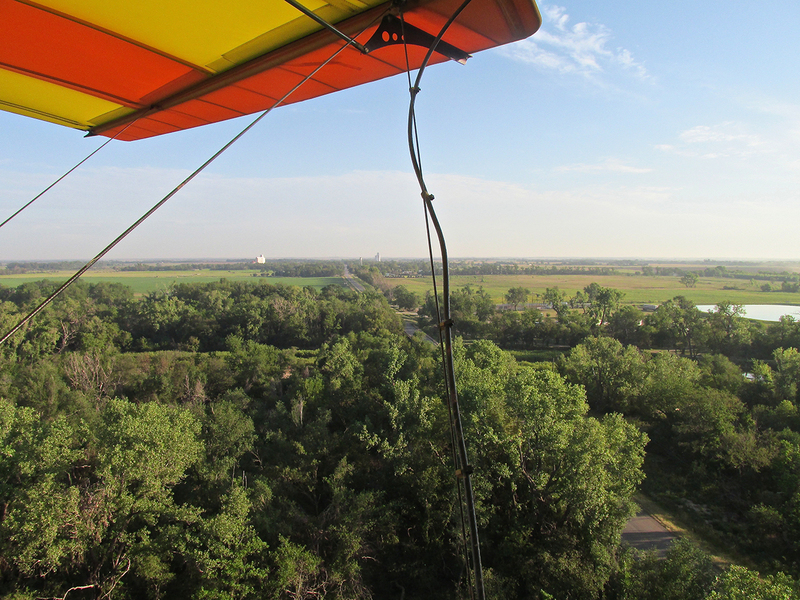 I told him I had flown in early that morning from Wichita in my Ultralight and had just returned from town after a look around and snapping a few pix. Stallings shook his head once, frowned and said, “Flat tire”. After I had landed, my right main wheel apparently had a small hole in its tube and it went flat while I was around town. The beautiful thing was that James, Michael and a couple other guys had seen it and already had multiple plans of action for me to take to remedy the situation. Depending on whether I wanted to change the tire, put “Green Slime” in it or just pump it up in the thought it would last a two hour flight – the guys had me covered. After weighing the alternatives I went the “Green Slime” route. Wal Mart was not far away so I got some there and put it in the tire. At his introduction, I called him “A Man of Many Talents”. Michael again proved that as he produced a jack suitable for scooting under my MXL’s low axle. Then James Stallings backed his pickup to the plane, air compressor at the ready on the bed. So, shortly after my return from Wal Mart, the tire was aired up and I was ready to roll. So What’s The Providence In All That? I knew you would ask. So here it is. That tire was going to go flat sooner or later. 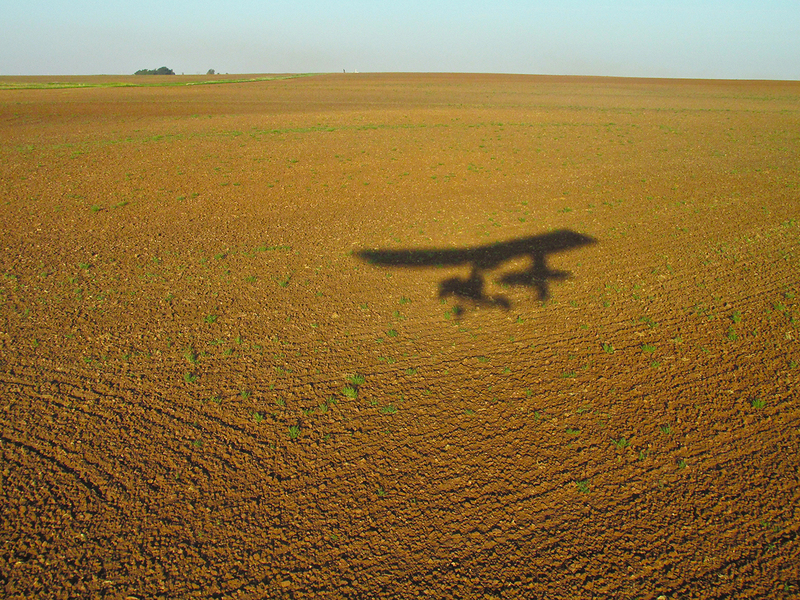 There are places I have flown over and sometimes landed on during this Flying Season where I was the only person for as far as I could see in all directions. Some of these places do not have roads. I suspect cell phones are ineffective, too. 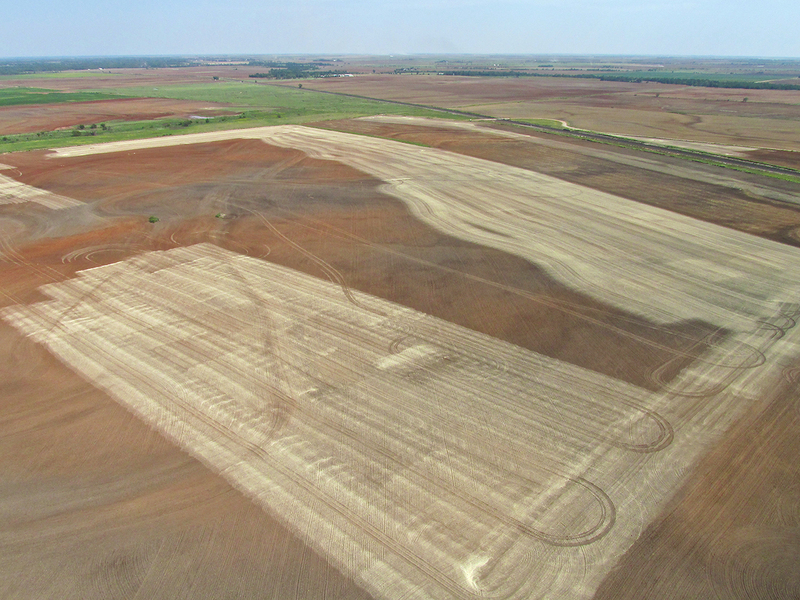 I see God’s Hand directly involved in the timing of this flat at Alva. Not only did the flat happen at an airport but He put me in the midst of guys who wanted to help. 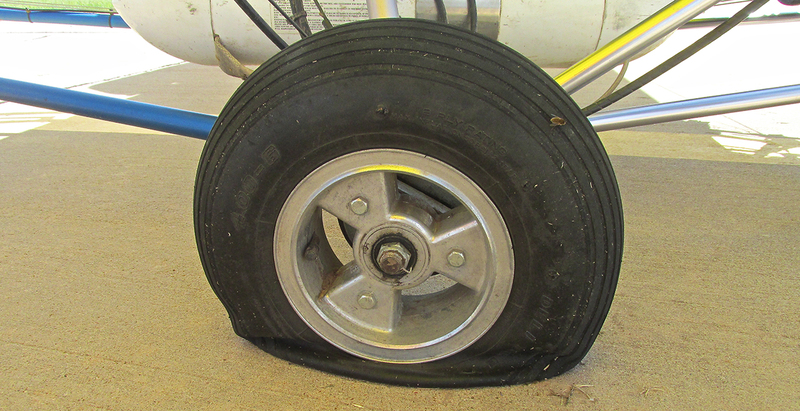 I was able to get the tire fixed with a minimum of difficulty AND I was alerted to this huge “problem potential” for my Future Fun Flights. One I should have considered all along. I thanked all the guys for their help. The tire was holding air just fine. Wind on the surface had risen to 15 mph gusting to 20. Rather than taxi to the runway, on the ramp I turned into the wind, poured on the coal and was airborne in less than 30 feet. 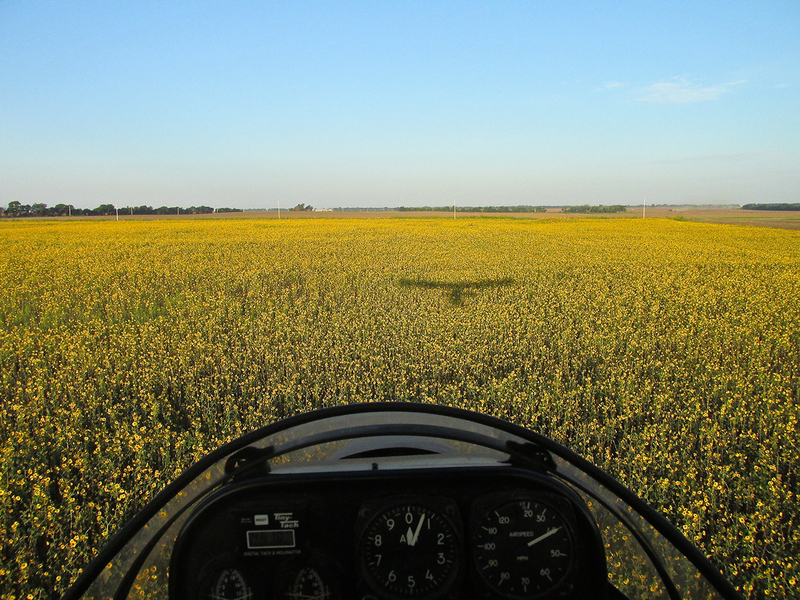 Before grabbing the bearing back to Selby Aerodrome, I encircled Alva to the North so I could get more pictures of it. The following series is that result. 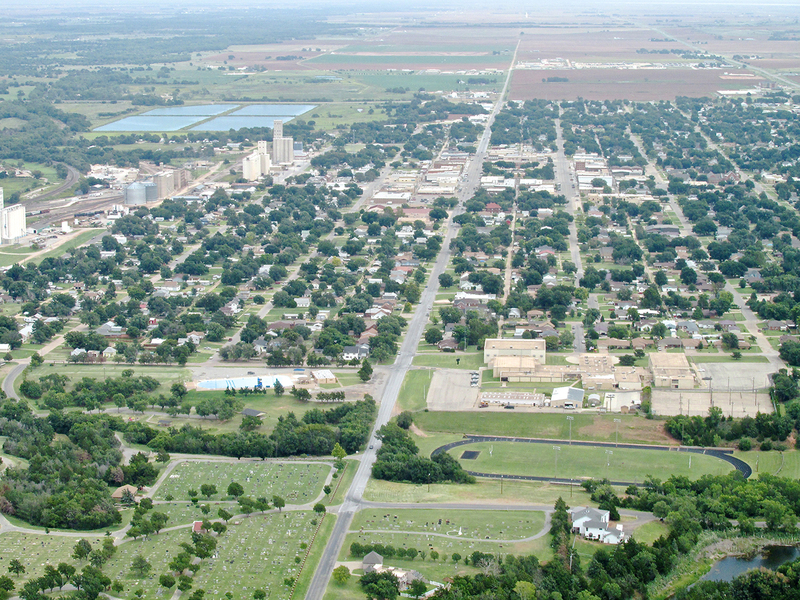 This final shot of Alva is from the North at 1,500′ AGL. 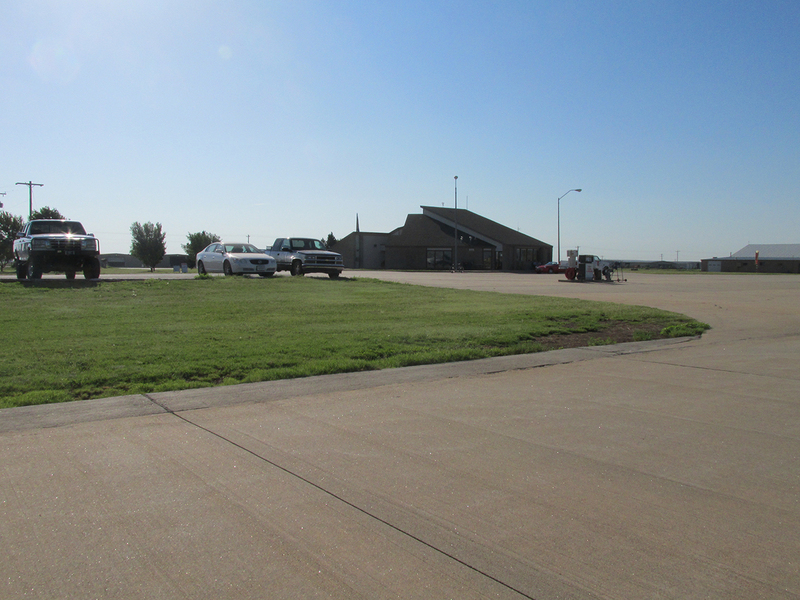 Alva Regional Airport is seen on the West side of 6th Street / Highway 281 heading South. 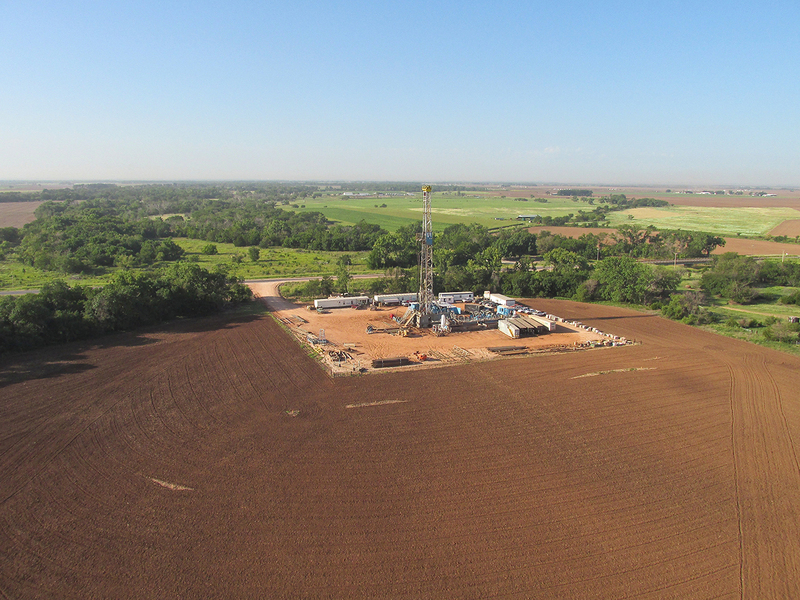 Most people in America have heard about the new technologies in Oil Production called “fracking” and Horizontal Drilling – better referred to as Directional Drilling. The area I will be flying over next has been a “hot zone” these last few years for the use of these technologies. 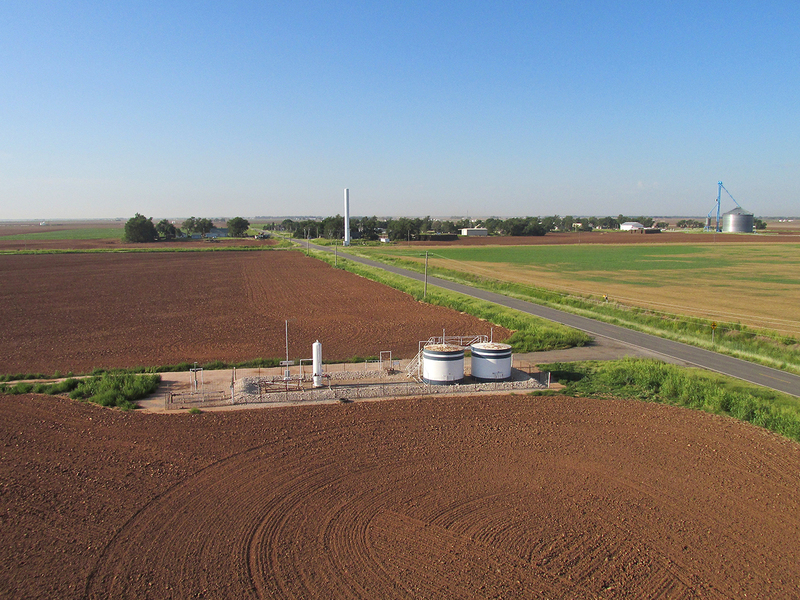 This next series of photos will give you a “birds eye” view of it and a feel for the huge sums of money being spent in hopes of discovering more oil and gas. 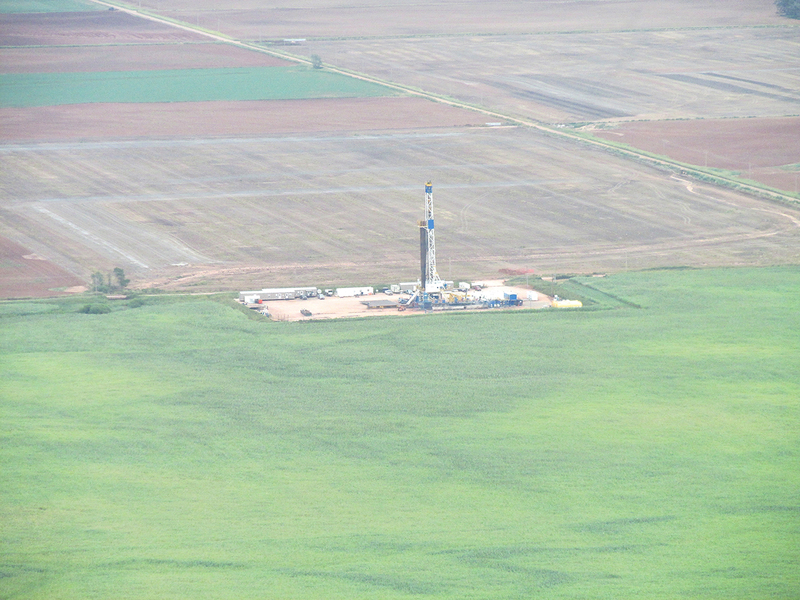 An active oil drilling rig a short distance North of Alva. Frankly, I’m not sure about this shot. I think I was shooting Northeast. 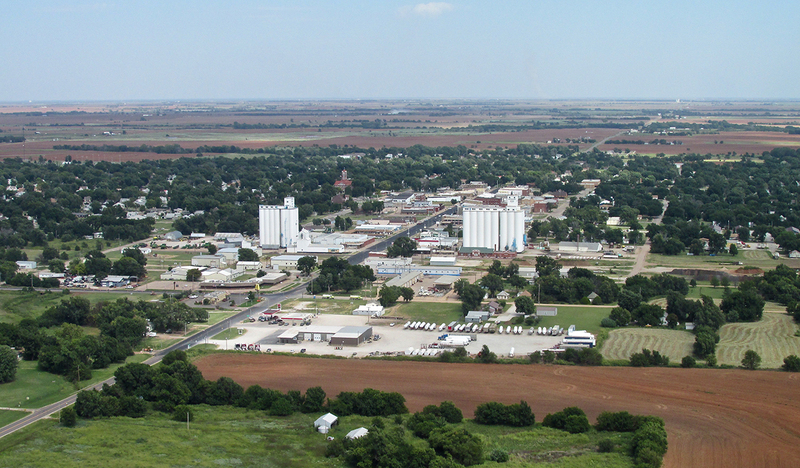 That could be Capron, Oklahoma in the distance. 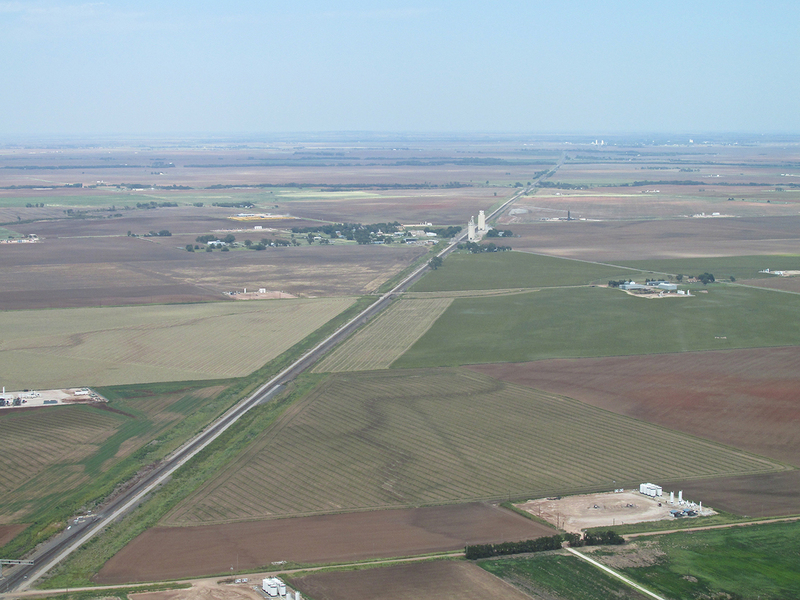 Southwest of Anthony, Kansas, an excellent view of the massive oil field effort I spoke about earlier. 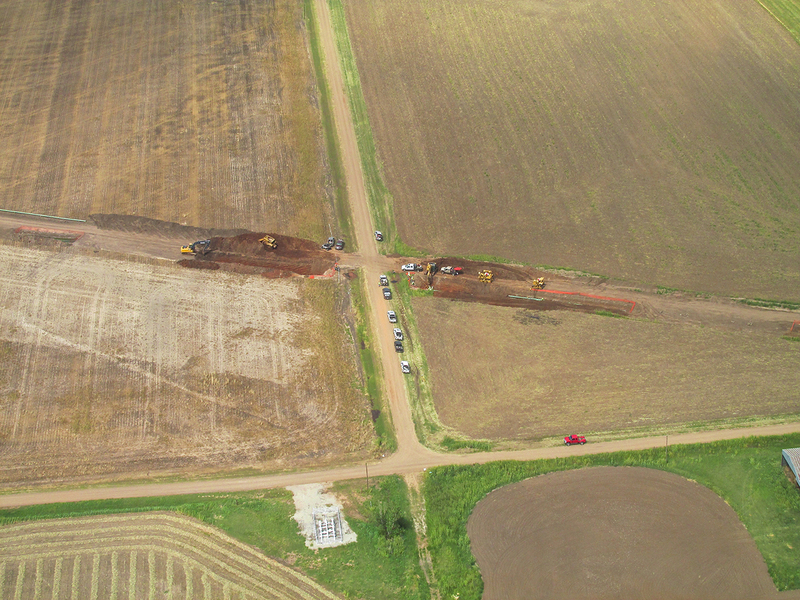 All the large white “pads” are drilling sites or recovery points. They seem to trail off to infinity East and West. I am at 1,800′ AGL looking Northeast. This is the first “line” of three I crossed. 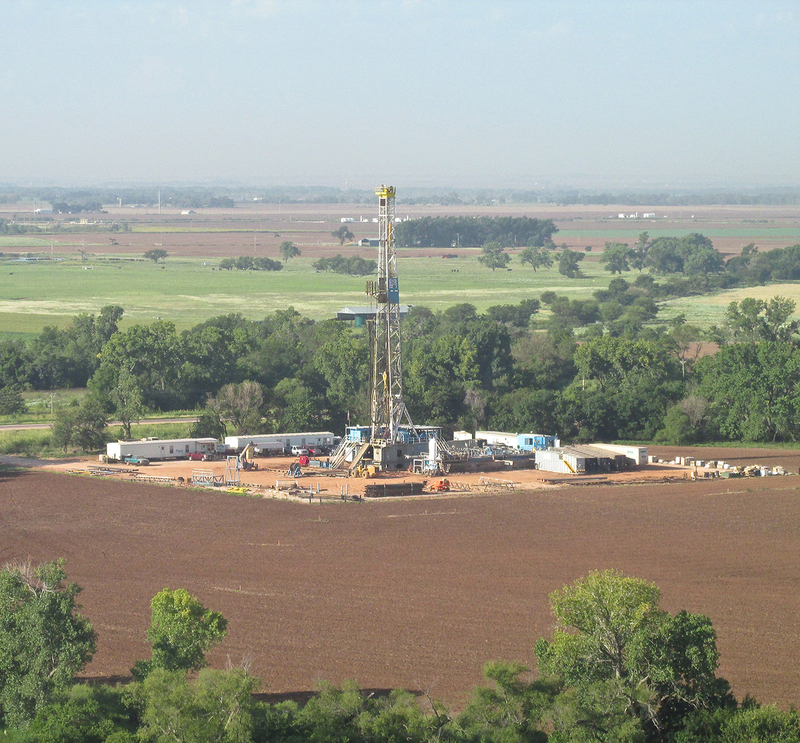 I took this telephoto shot as I passed over the active rig seen in the previous wide shot. I am at 1,800′ AGL. 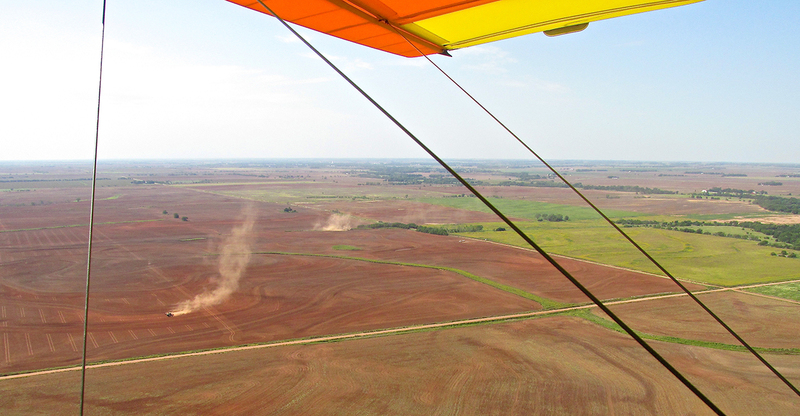 I glanced to my right and saw the bright white reflection of the sun off the Salt Flats West of Cherokee, Oklahoma. 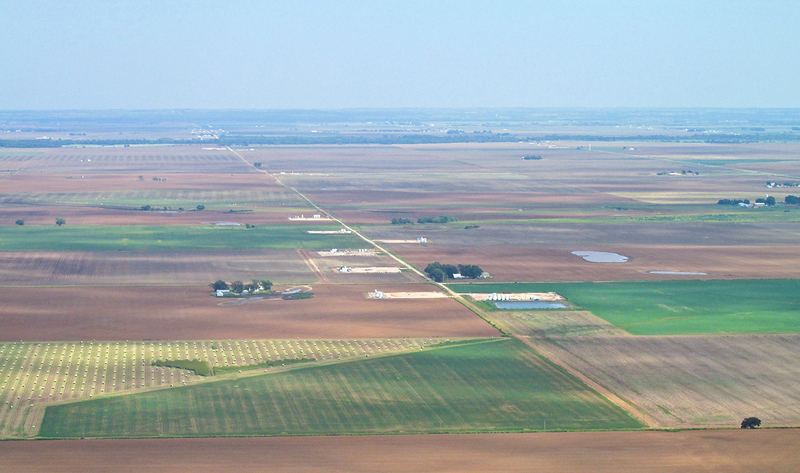 I traveled there before and wrote about it HERE – From 1,800′ AGL Looking Southeast. Then I looked due East to see another excellent representation of the drilling activity spread out along a long country road. I waited until I was a bit more North to give a little “angle” to the shot. 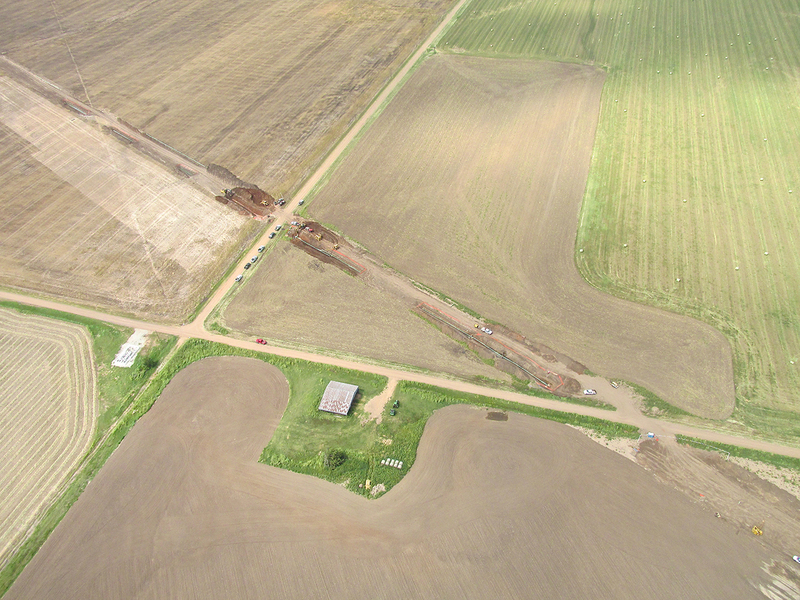 I am at 2,000′ AGL and the first “pad” is about 8 miles East of my position. Farther Northeast I approached another long “train” of drilling locations. What really caught my attention, though, was this large holding tank being installed. This is looking East from 2,000′ AGL. West of the large tank I saw this crew connecting a pipeline to it under a road. I would think this means they found some oil. One more shot of the tank before I left the area. 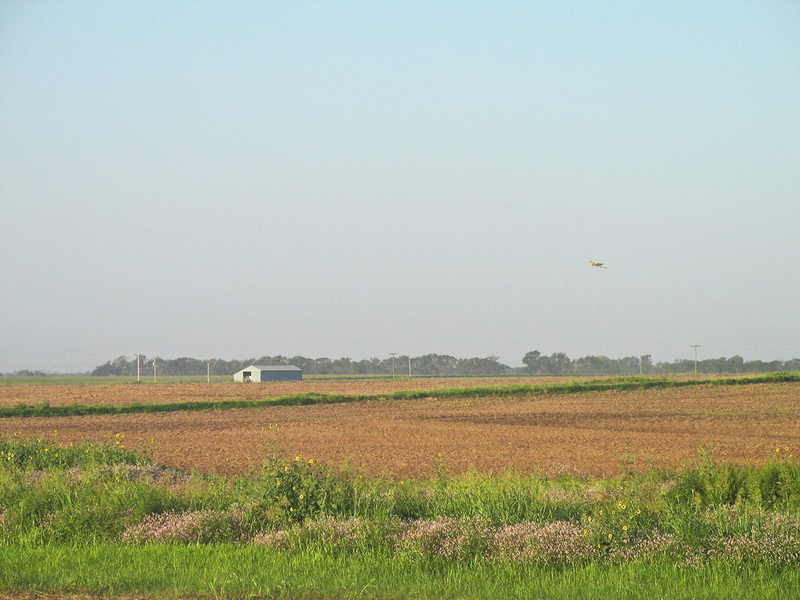 Note the Dust Devil in the field to the Southeast. The air was quite turbulent and hot at every altitude I tried. 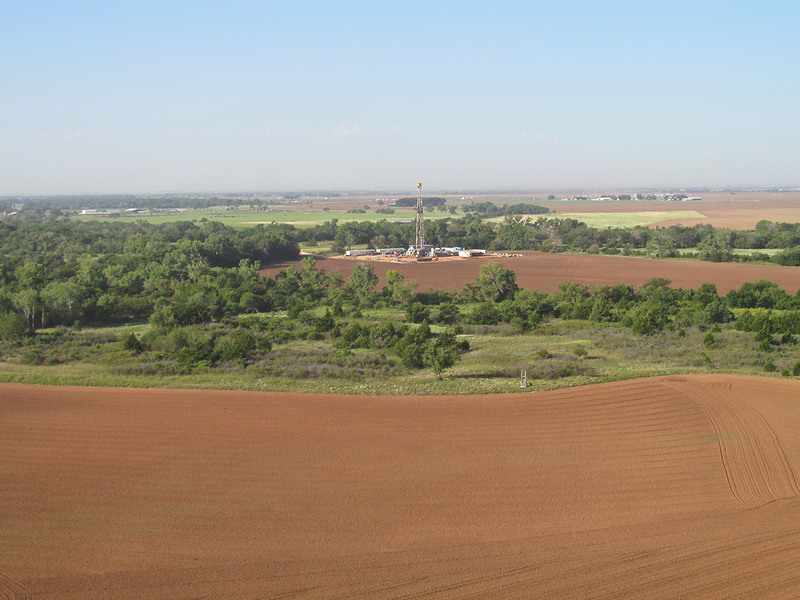 Shooting East, a telephoto showing another long line of drilling pads. A little while later, another one. This is looking East from 1,200′ AGL. The same line of pads but this time looking “straight down the barrel”. Then I looked South under my right wing to see the first two “oil pad lines” with the Cherokee Salt Flats in the distance. 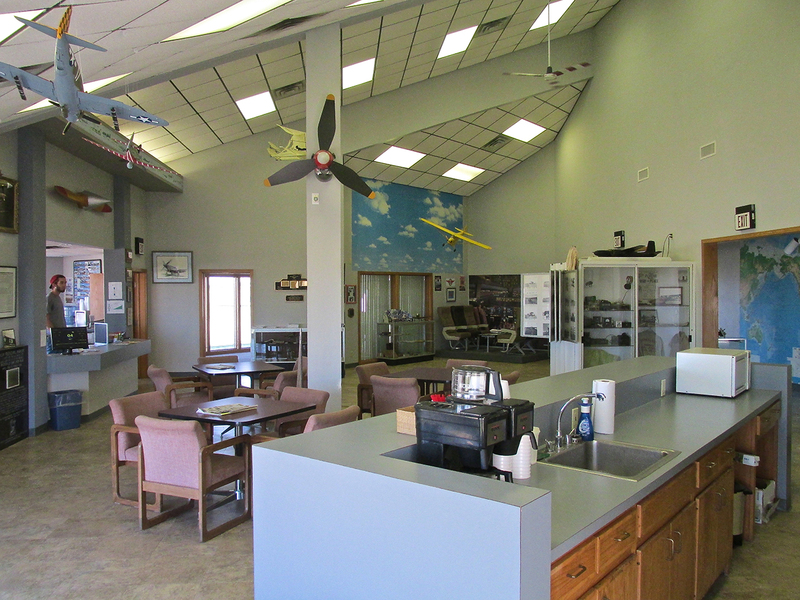 I visited the Anthony Municipal Airport a while back but have yet to tour the town. I will do that in a Future Fun Flight and report to you what I see there. I do know Anthony has done well by all the drilling activity of late. When I stopped there on the way back from Cherokee, their airport was in great condition and featured a brand new, credit card activated fuel system. I liked the way the dust lifted into the sky. This also shows you how windy it was and the heat rising from the ground. This is an excellent example showing a method for changing the pH of the soil. I think they are spreading lime. Many times I have passed Conway Springs in the distance. 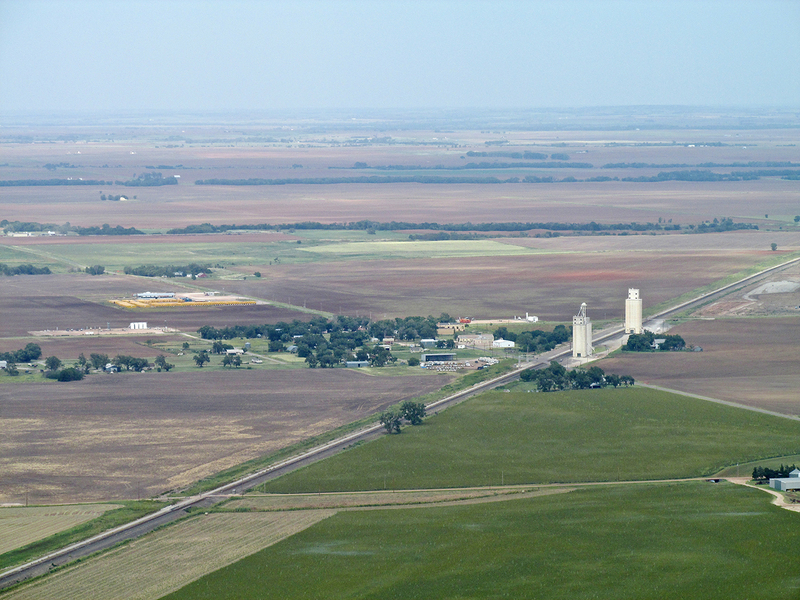 On this day my path to and from Alva brought me right over it, although I purposely detoured it to the South. It looks like an interesting stop for The Sky Surfer although it does not have an airport. 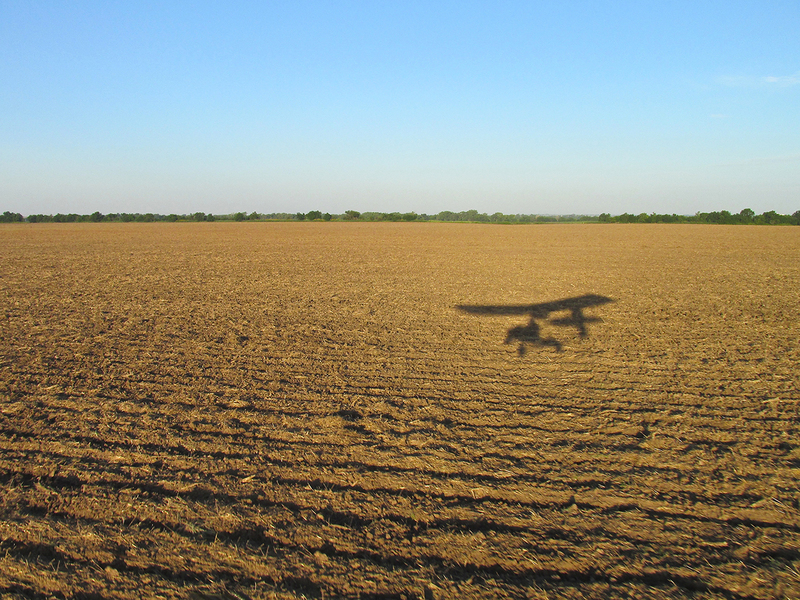 Next season I will see if there is a suitable field I can land on nearby and walk into town. 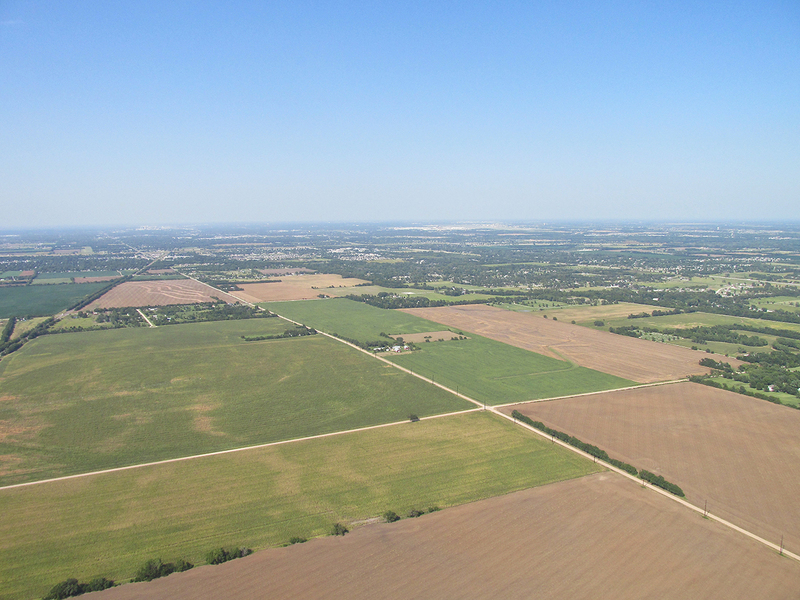 Conway Springs, Kansas from 1,500′ AGL looking Northwest. Same as above but a telephoto of the downtown area. One of my all time favorite movies is “Flight of the Phoenix” – the one with Jimmy Stewart in it – no other will do. An intense moment in this intense movie is when Pilot Jimmy Stewart realizes that the German Engineer overseeing their attempt to resurrect their broken airplane is discovered to be a designer of model airplanes. Jimmy nearly beats him up. The Engineer makes the case that the only thing different about designing a model airplane from a full size one is scale. Jimmy doesn’t buy it but basically has no choice. At the climax the Engineer makes good. My experience with RC Modelers is that they are every bit as adamant as the German Aircraft Designer in “Phoenix”. Their machines are AIRPLANES and deserve respect as such. Without looking for it I have many times come across the impressive airport shown below. One time I was flying “nap of the earth” and nearly “buzzed” the hangar area as flyers were readying their craft. I was approaching from the South (the tree line below the facility in the photo). Even though in an area devoid of settlement, about 100 yards out I noticed some little buildings through gaps in the tree line and pulled up into a left climbing turn. It was from that vantage point I discovered it was a Radio Controlled Airplane Runway complete with covered run-up stalls and storage buildings. I circled for a bit to the West and waved but none of them wanted to wave back. Anyway, this is one of the nicest RC Airfields in the area. I haven’t found who owns it. The Sky Surfer likes to think of himself as a Spartan. He purposely refuses to concern himself with heat or “hydration” issues, believing himself above such mundane concerns. 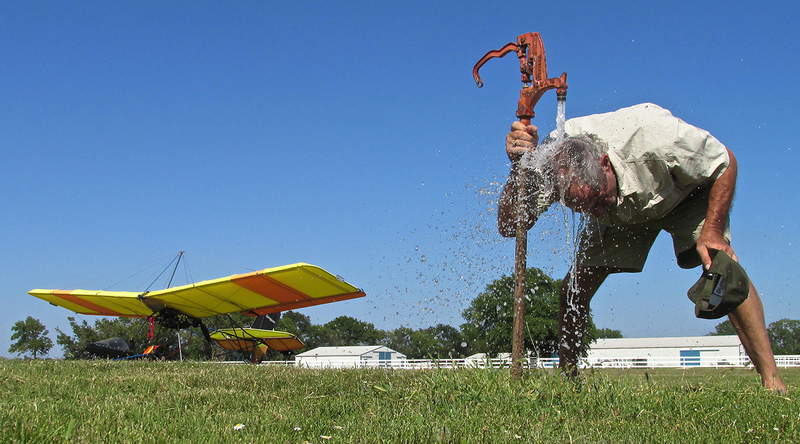 Also, for more practical reasons, he has found it inadvisable at his present age to drink much water at all before setting out on a Fun Flight. 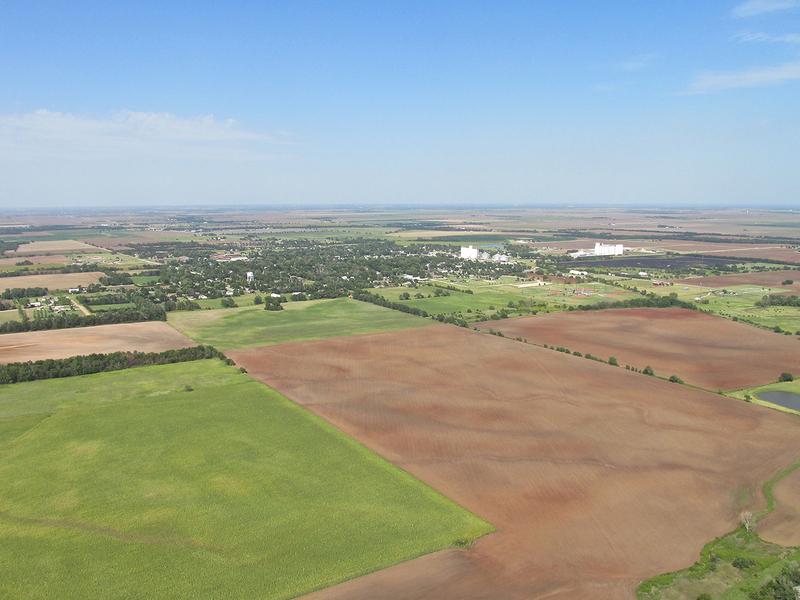 A recent Fun Flight to Cleveland, Oklahoma made this concern all too evident. This day, though, it didn’t matter what his ego believed, for soon after lift off his body became consumed with thirst. Too bad, because when flying, one has available only what one has on board. Surf brought no water to drink along the way. He was parched for two hours. Even though the desire for a cool drink of water overrode nearly all other thoughts, he shook out of his stupor when he saw some vistas on the final approach to Selby Aerodrome that needed photographing. 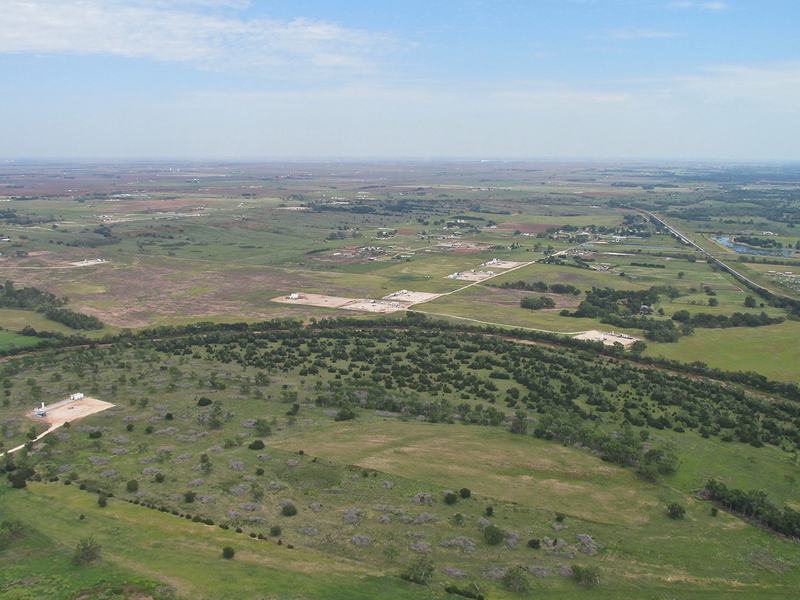 From 2,000′ AGL, this is looking Northeast at the Spirit Aero / McConnell Air Force Base area. 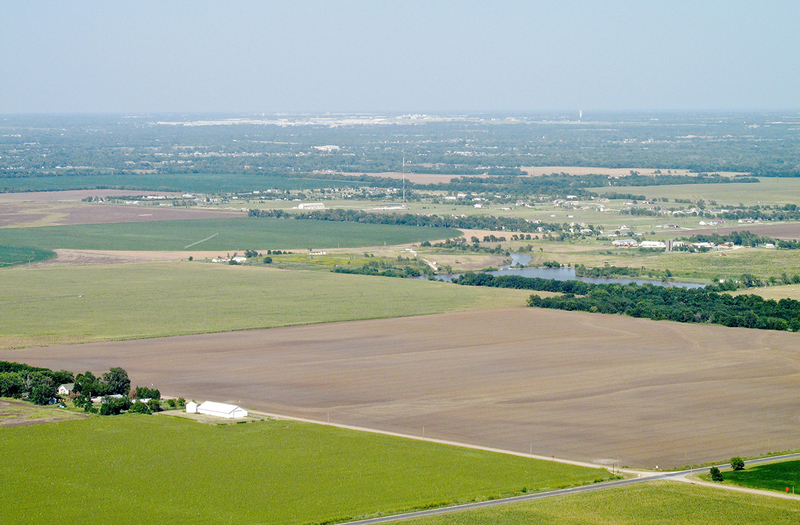 From 2,000′ AGL, looking North Northeast you can see Downtown Wichita to the left and Spirit Aero / McConnell AFB to the right near the horizon. 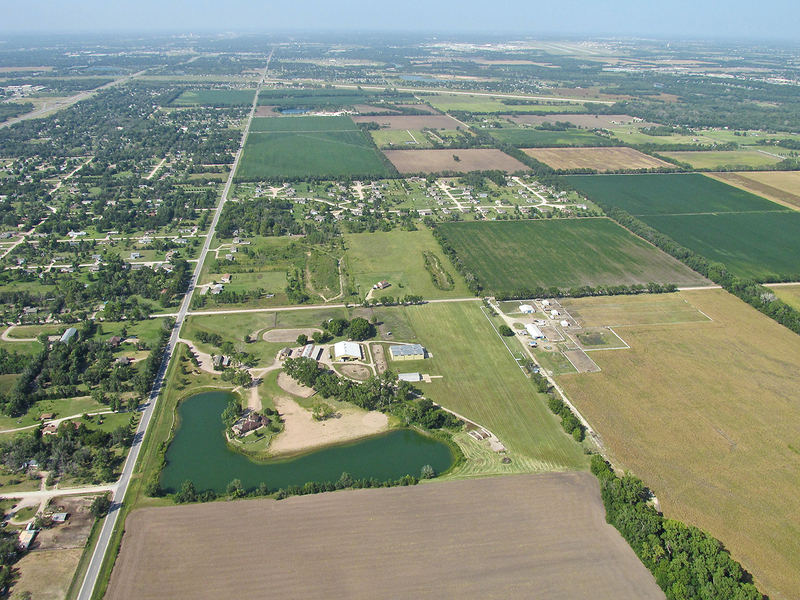 From 2,000′ AGL looking North, you can see the proximity of McConnell Air Force Base to Selby Aerodrome. We are 6.5 miles from the center of their runway. This last photo I took before making my favorite “spiral entry to landing”. 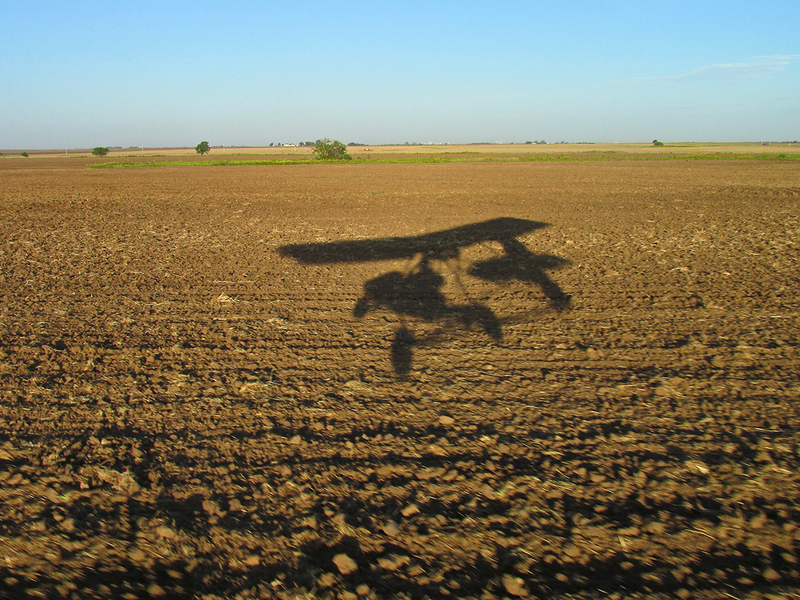 When I approach a field that has no traffic and I am two or three thousand feet above it, I like to spiral down to the Base Leg of the pattern and then land. Today the conditions were right for this. From 2,000′ AGL, I was able to make eight turns before entering the pattern. Selby Aerodrome and Horse Stables. 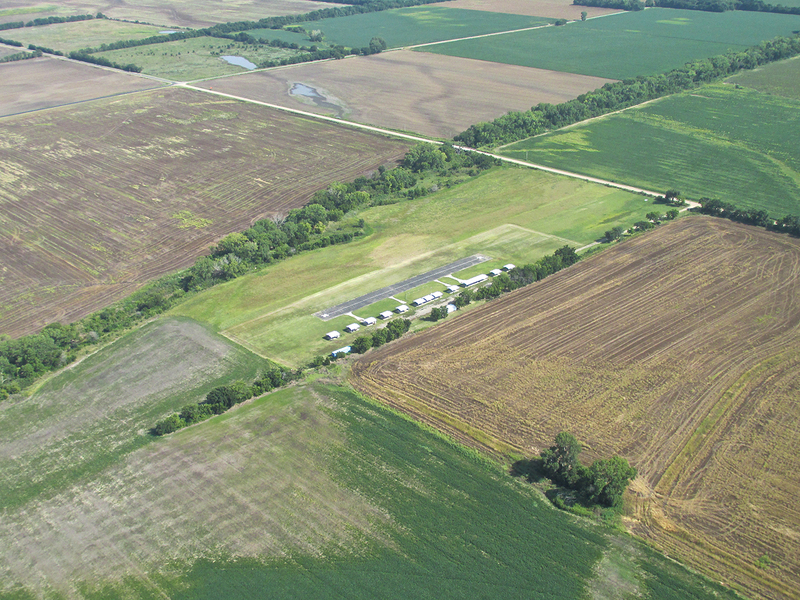 The grass runway is evident as is our yellow sided hangar. 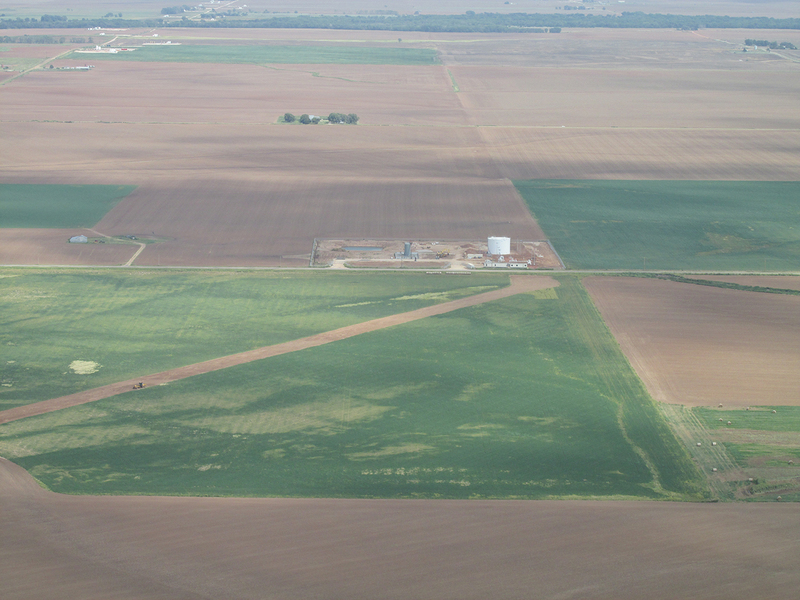 The dark green field to the upper right of the runway is the area over which I made the spiral entry. 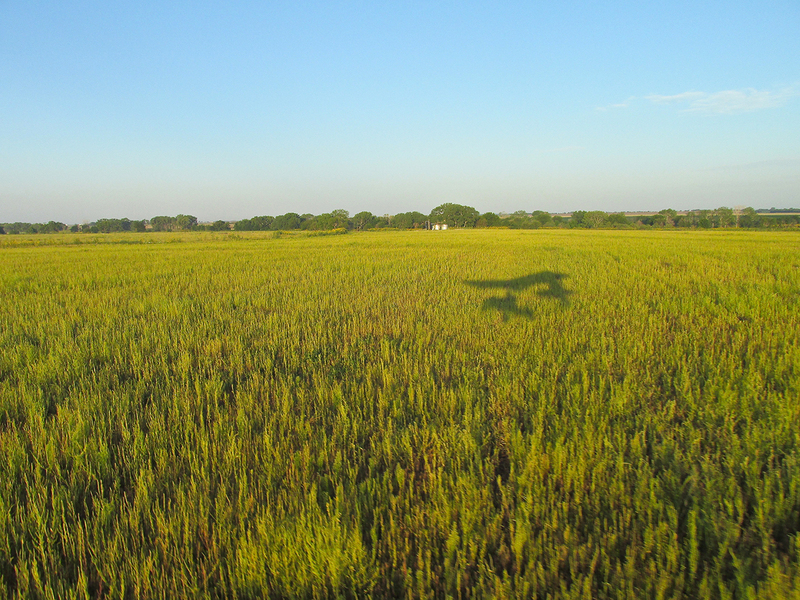 My Flight to Alva, Oklahoma! 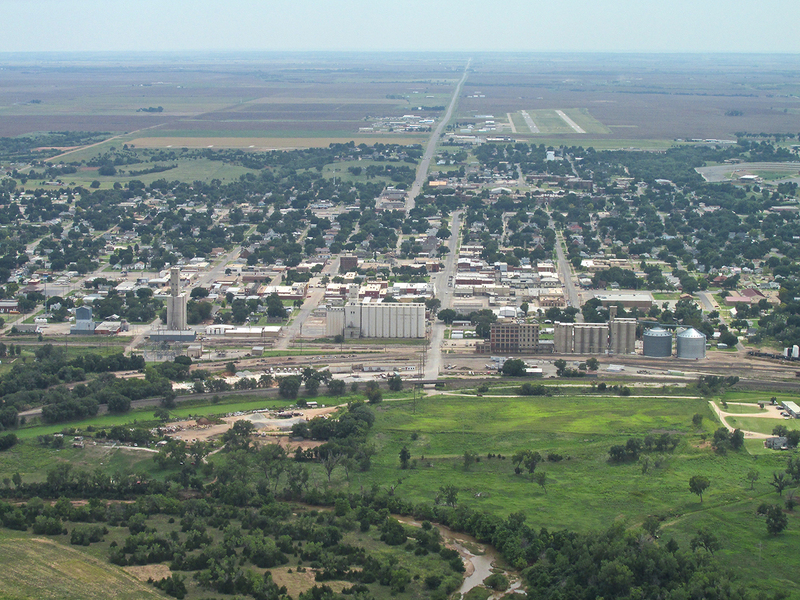 Having grown up in Alva and a retired Navy 1315 and commercial airline pilot found this very interesting. 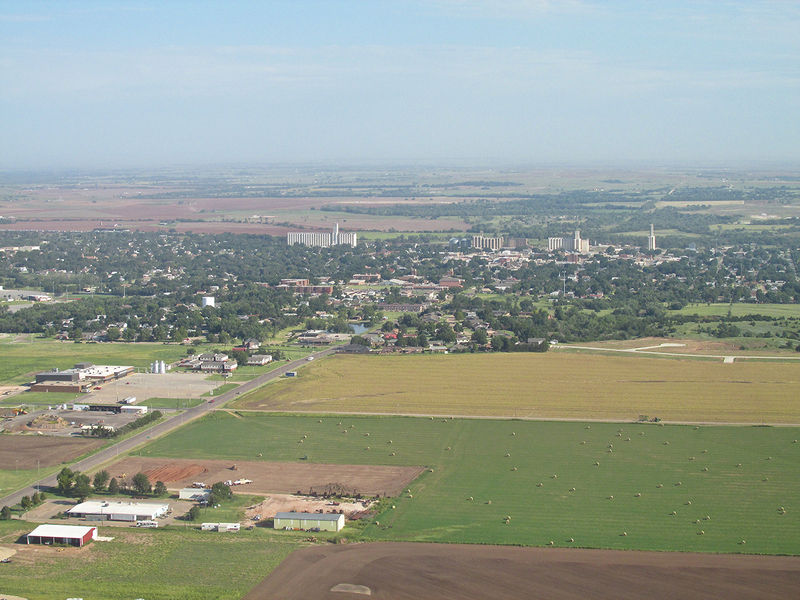 One of the last pics facing north has the farm where I grew up in the foreground. 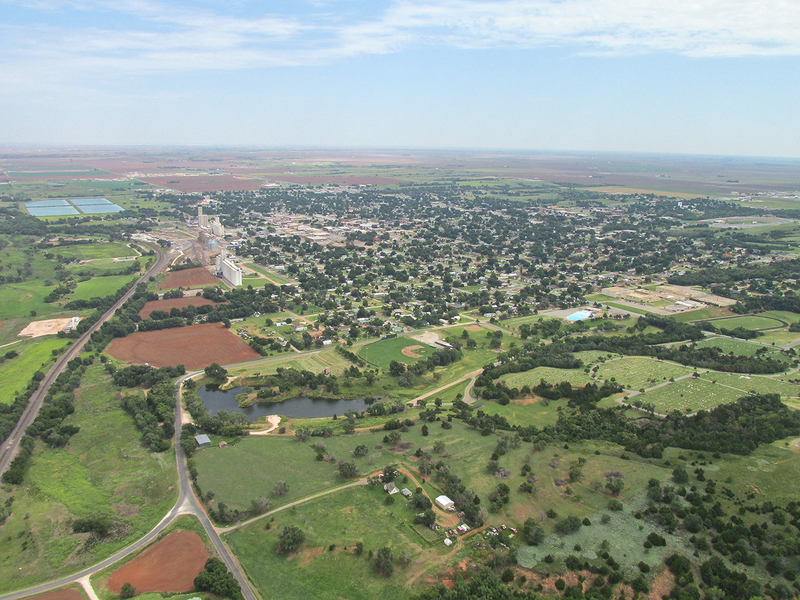 Have not been back to Alva much recently but your blog made it seem like some improvement since I was there last. Glad to have you on board. I really enjoyed Alva and will return in the future. I have taken quite a number of flights to Oklahoma in this program of mine. 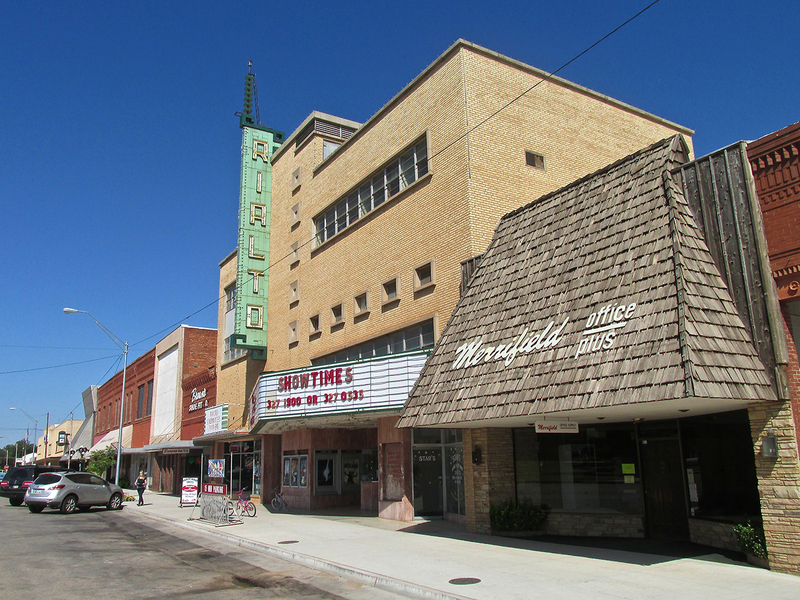 I am finishing a story about Foraker, Olahoma and then I will write my piece on a flight to Waynoka two weeks ago. I try to get these stories out the same week of the flight but that is not always possible. The Flite Blog™ is open to all. If you have interest to write or post pictures, let me know and I will upgrade you to “Author”. I have enjoyed looking at your photos so much. Thank you for sharing. I am gratified with your response. 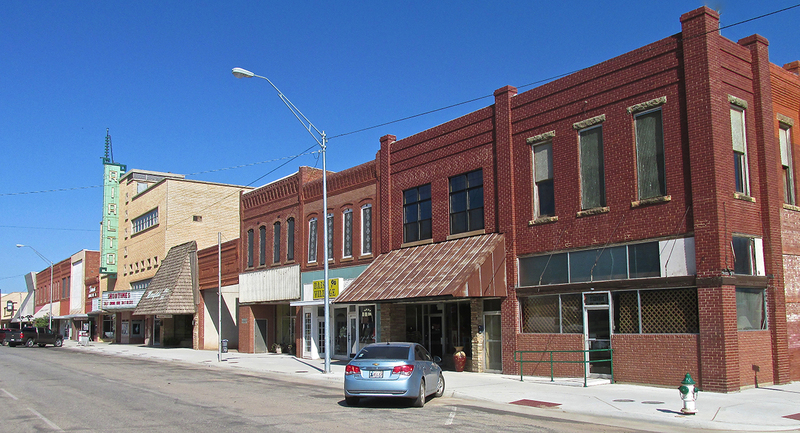 I am working on a story about Waynoka, OK and then one on Attica, KS. 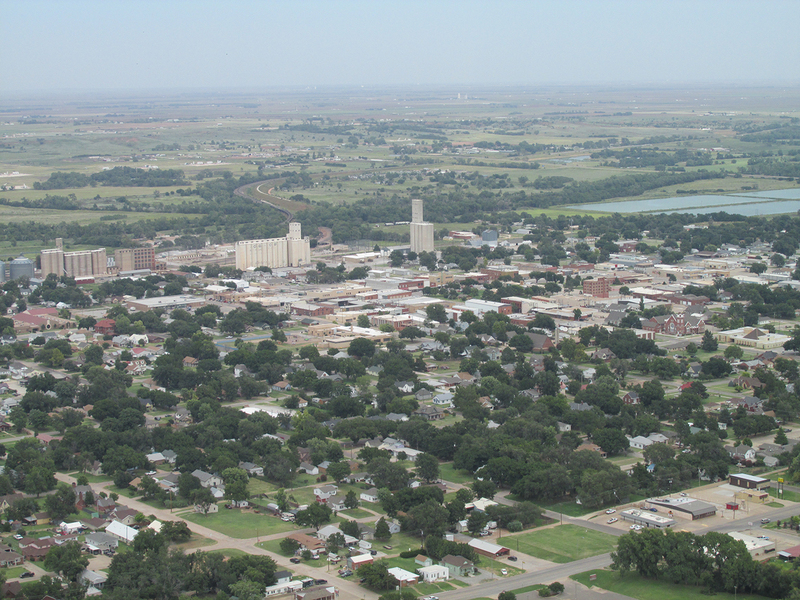 While I will be in hiatus during the cold weather, I will be back at it in the Spring continuing my barnstorming tour of small towns in Kansas and Oklahoma. If you would like to be included in my regular mailing list please respond to this email and I will do that. 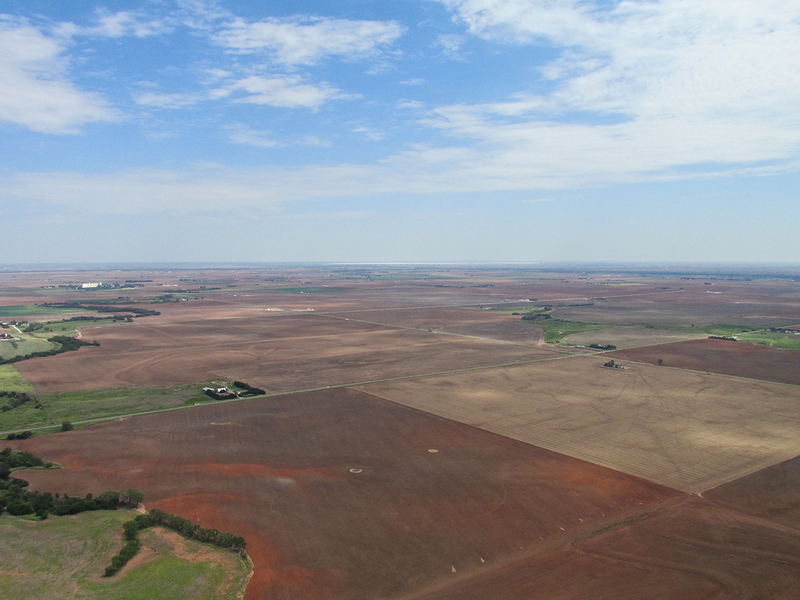 Loved seeing the aerials of your flight across northwest Oklahoma area. 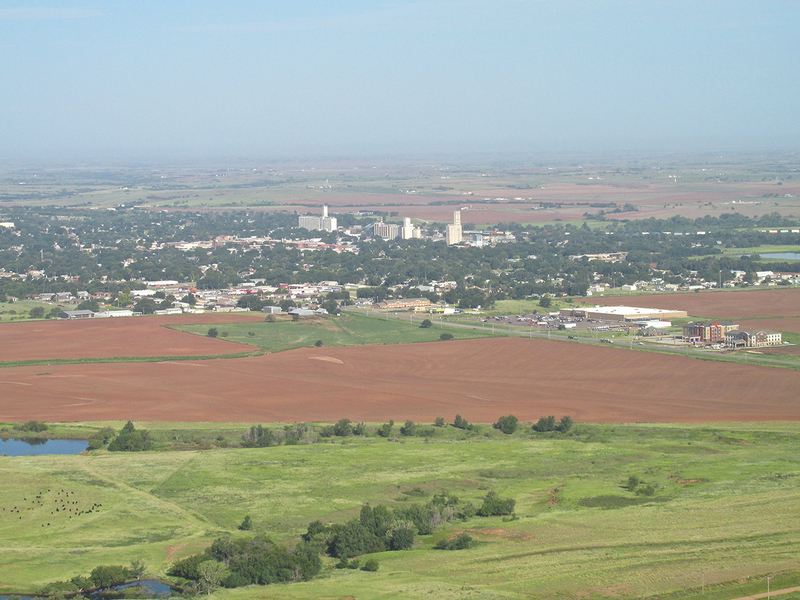 I was borne and raised in the Alva, Waynoka and northwest area, and family farmed and ranched west of Alva and north of Waynoka. My dad (Gene McGill) was a flyer, but in a Cessna. 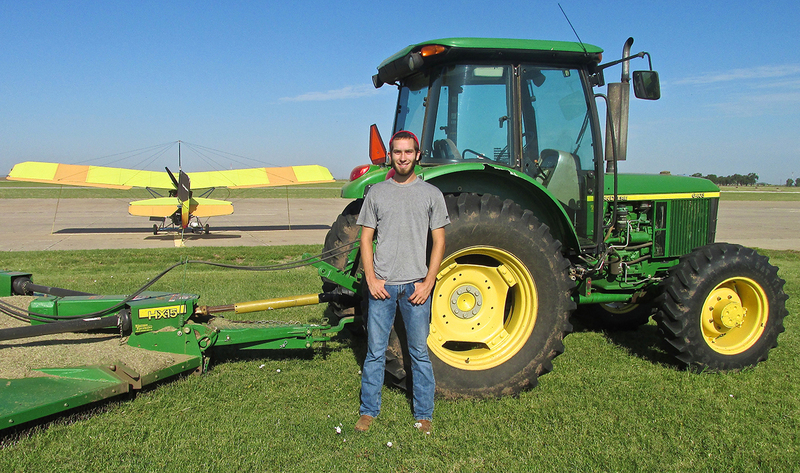 He did a few belly landings at the Alva Airport. 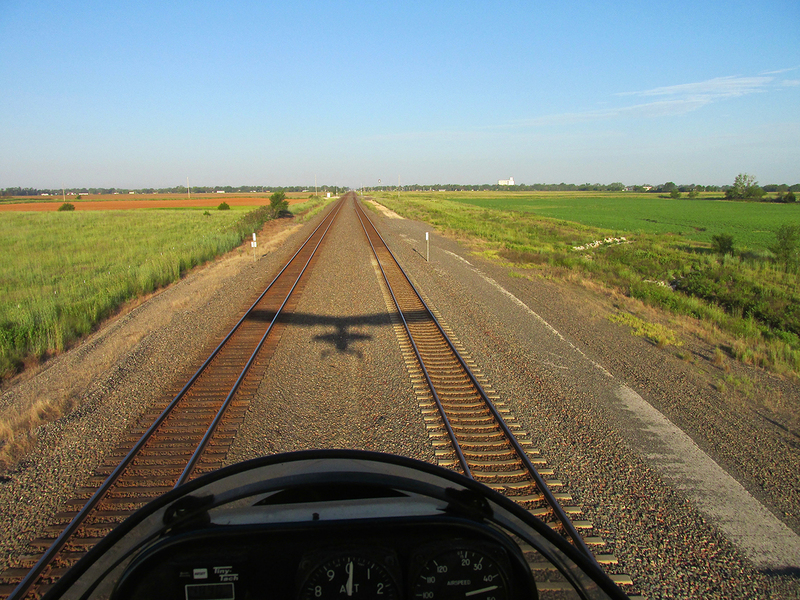 Have you ever thought about using a GoPro camera with your Canon on your flights? Thanks for sharing your sky surfing photos and history. I am glad to hear you liked the report. 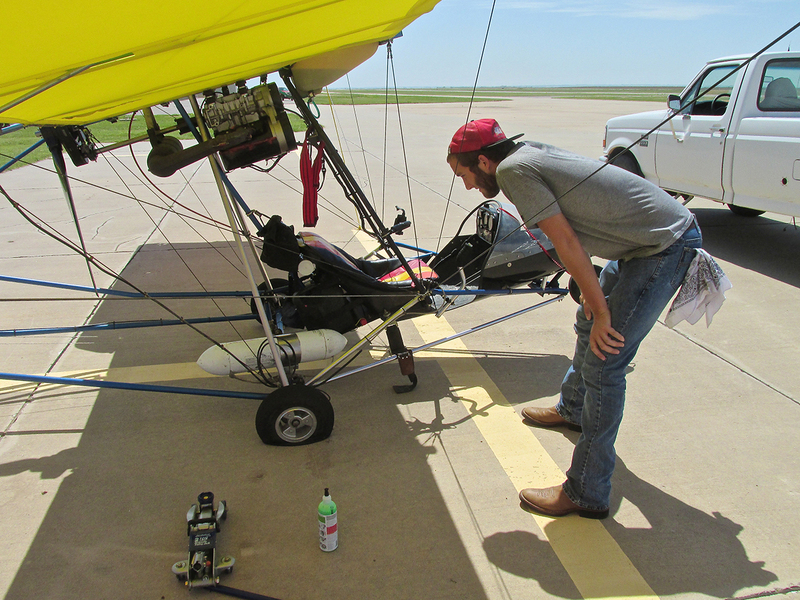 Interestingly enough over the weekend I was encouraging 2 other pilots I know to make the trip to Waynoka. It is a nice airport, fine town and there is plenty to look at including Little Sahara and the excellent museum. That is my YouTube Channel. I appreciate you signing up on “Sky Surfing – The Flite Blog™”. After seeing “Lil Prop” you might want to subscribe to my YouTube Channel also. I will be putting new movies on it all the time. Wow. 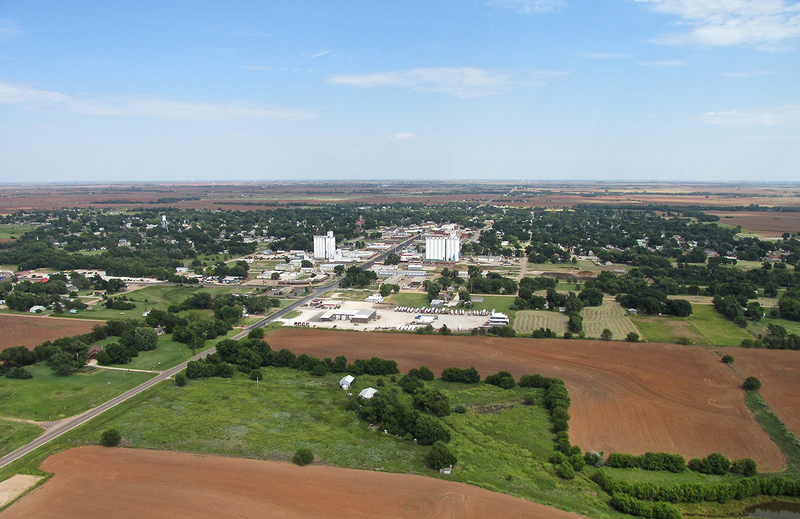 I just realized you were talking about the Alva story and I was thinking about the Waynoka story… Both are excellent places to go!